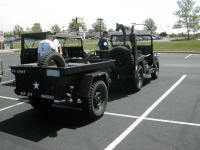 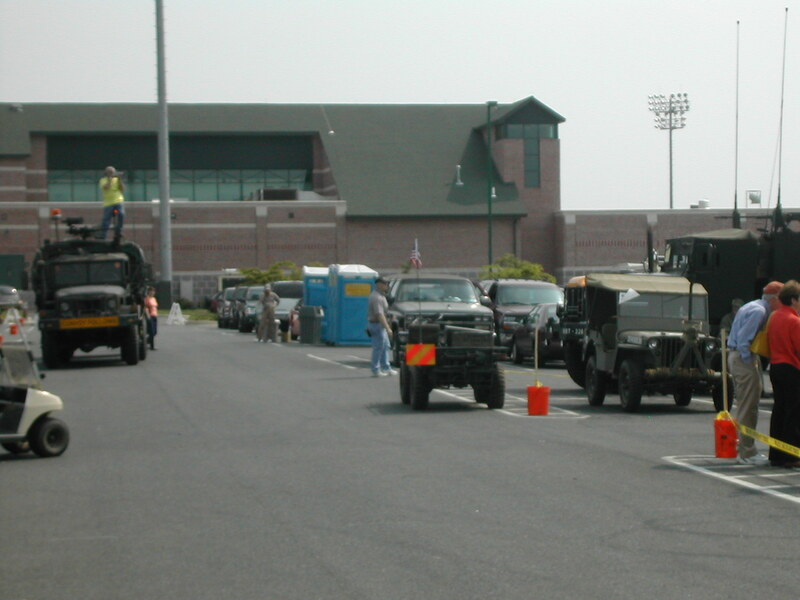 East Coast Convoy and East Coast Rally at Ripken Stadium in Aberdeen, MD. 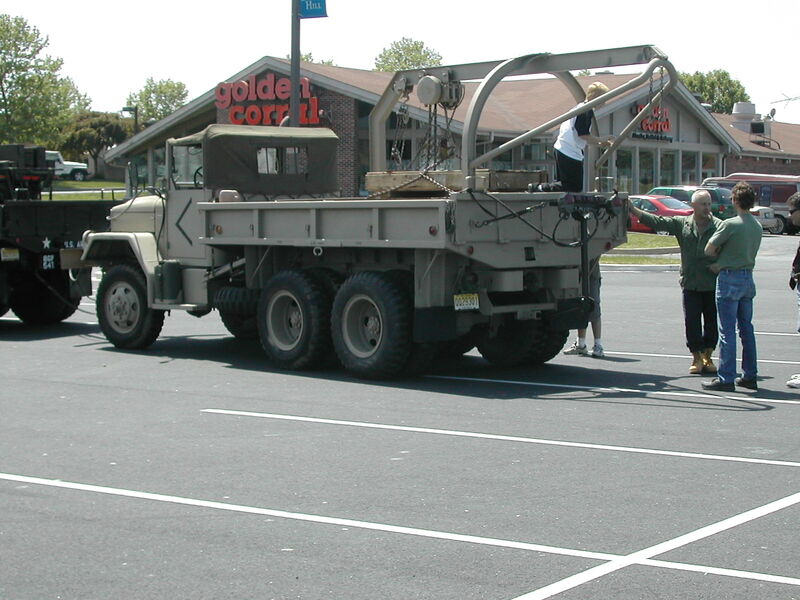 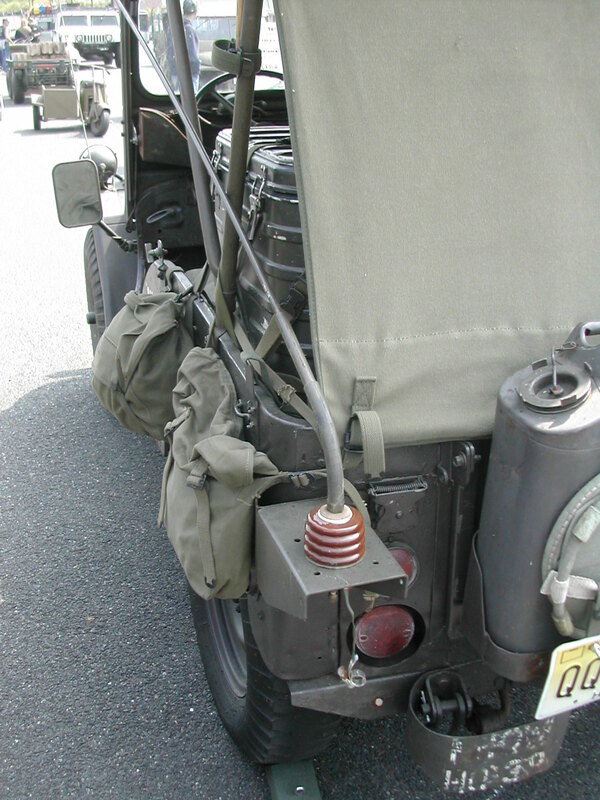 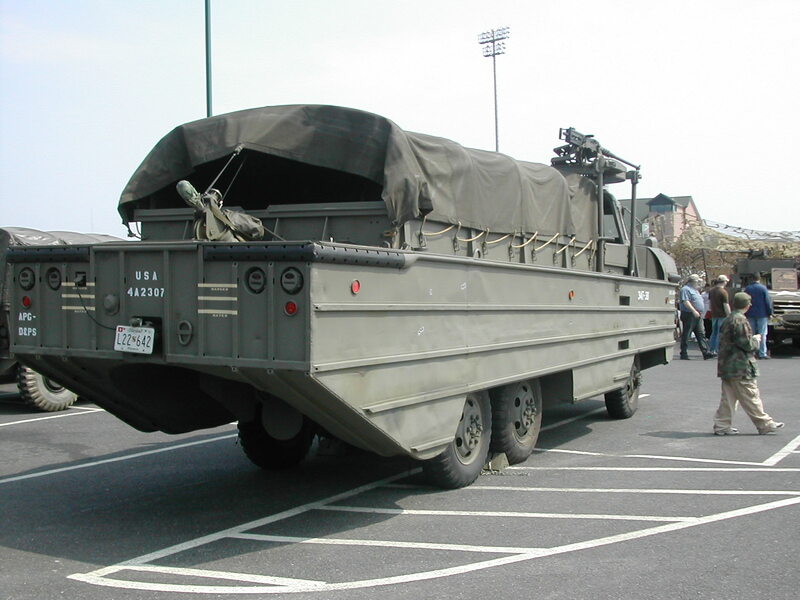 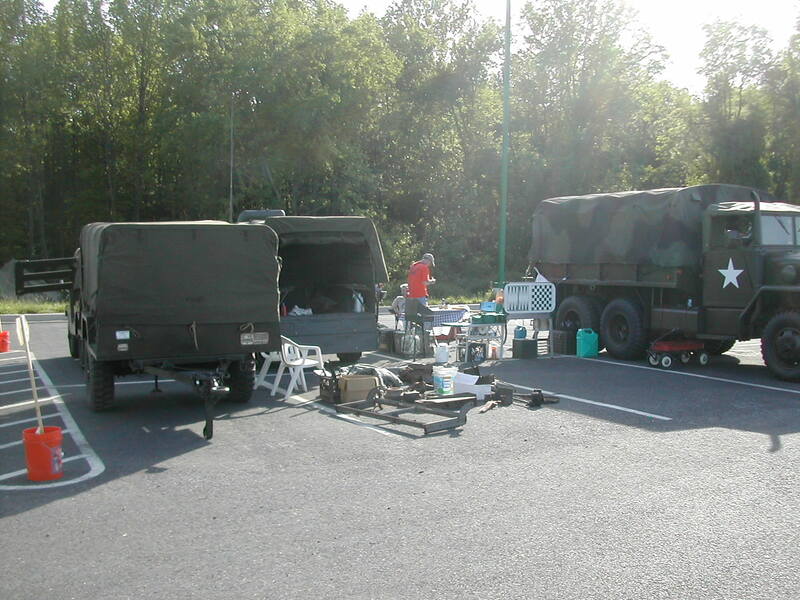 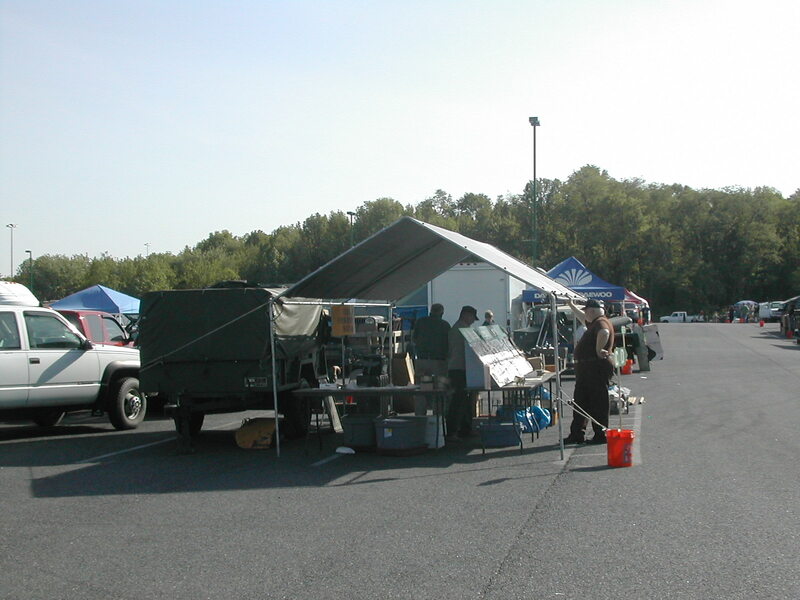 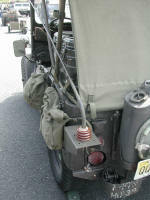 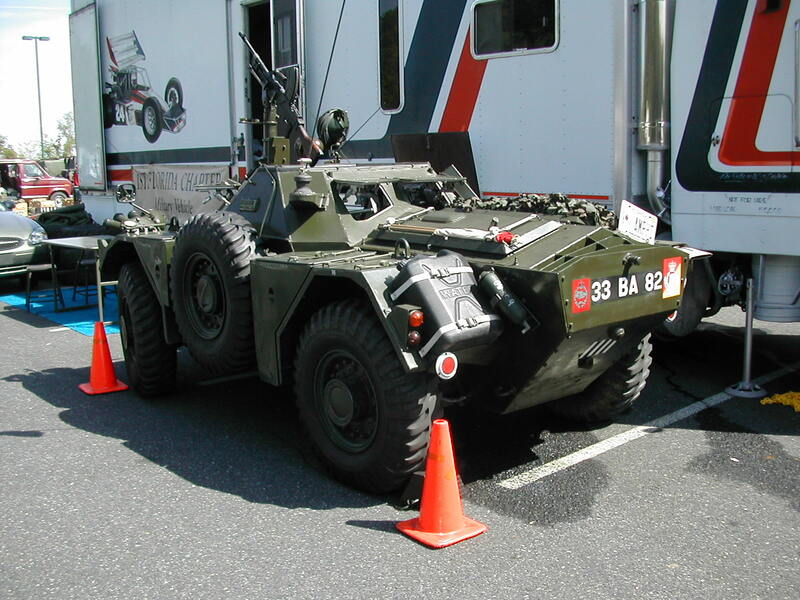 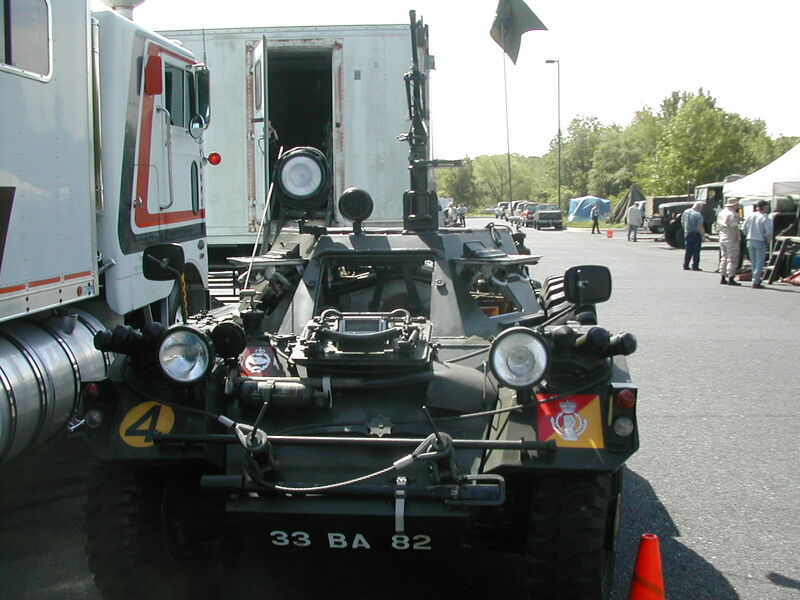 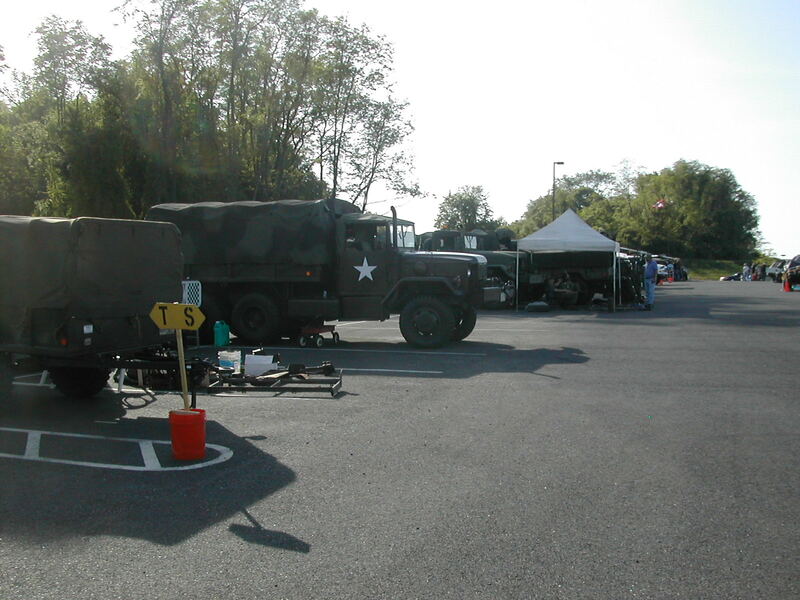 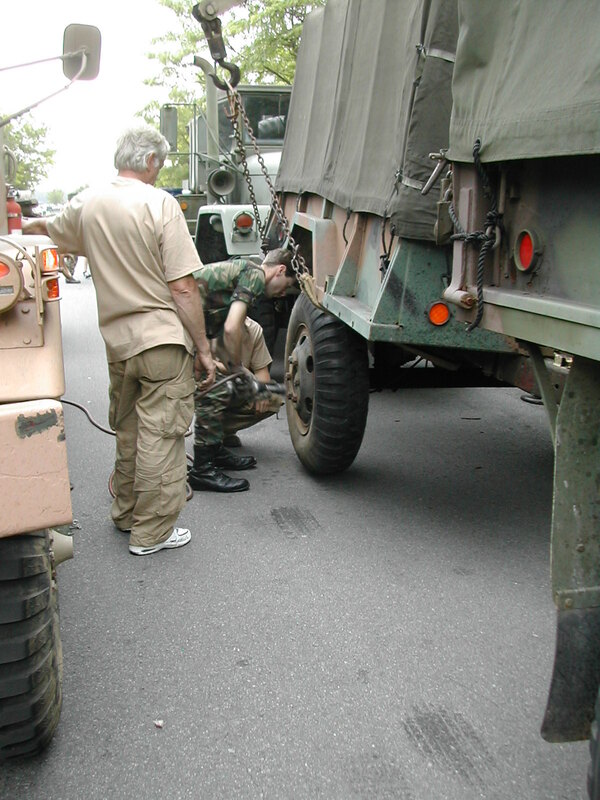 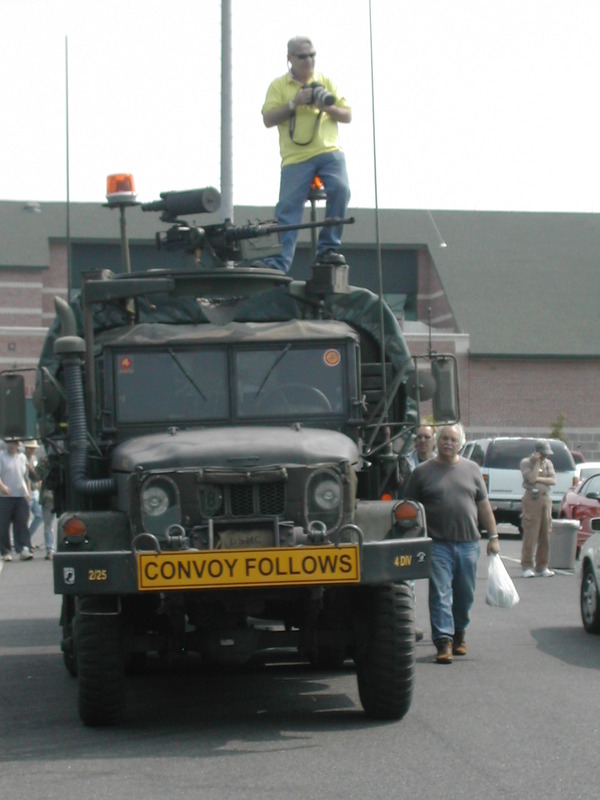 These are some photos that I took during the 2005 East Coast Convoy to the East Coast MV Rally held at Ripken Stadium in Aberdeen, MD in May 2005. 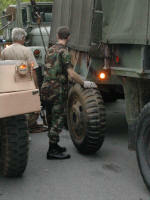 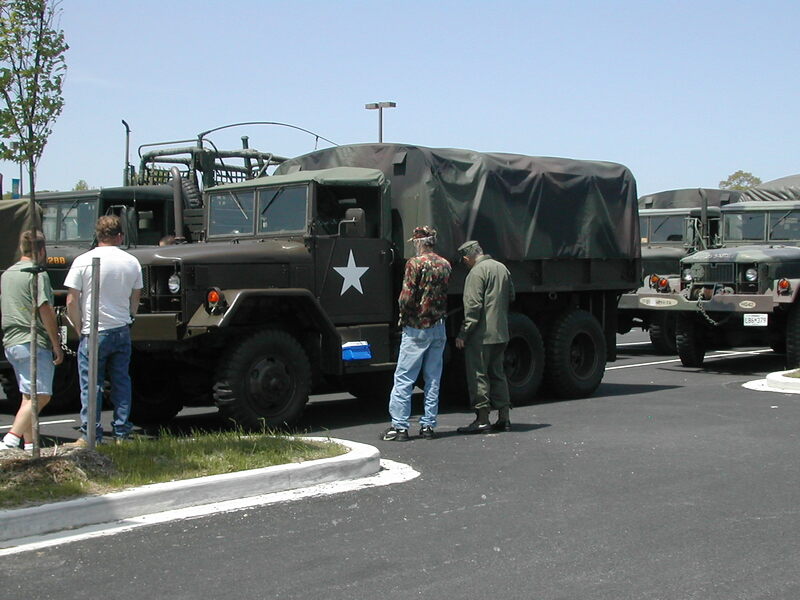 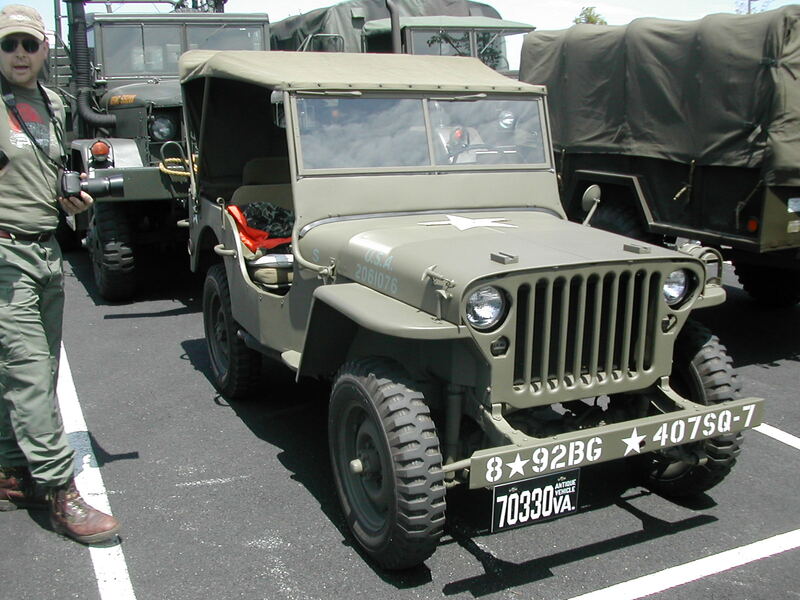 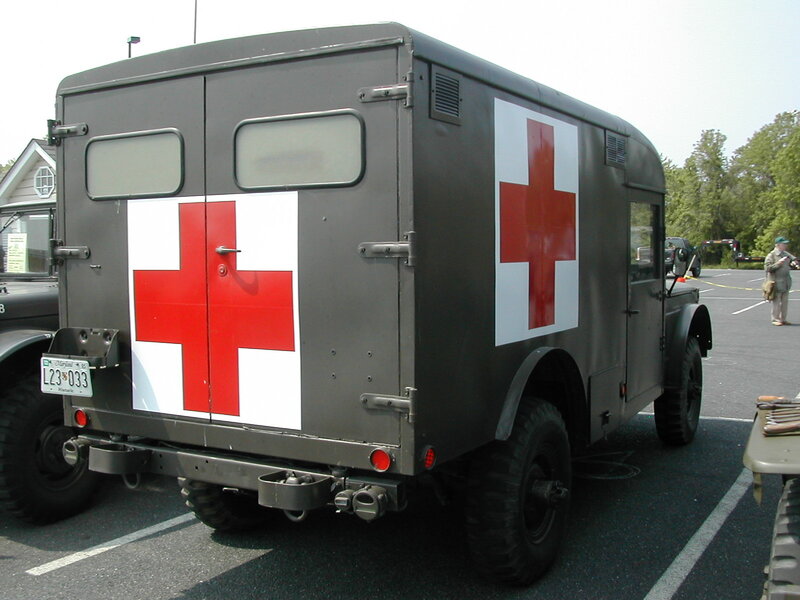 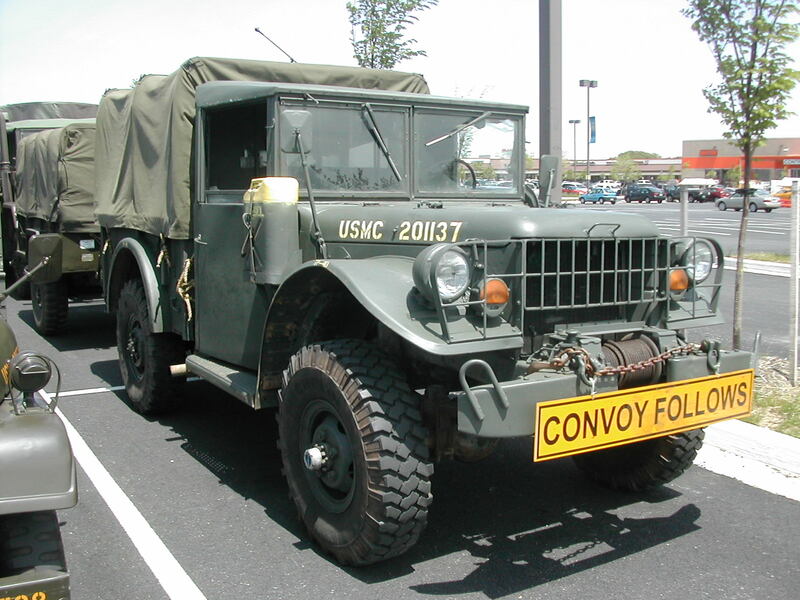 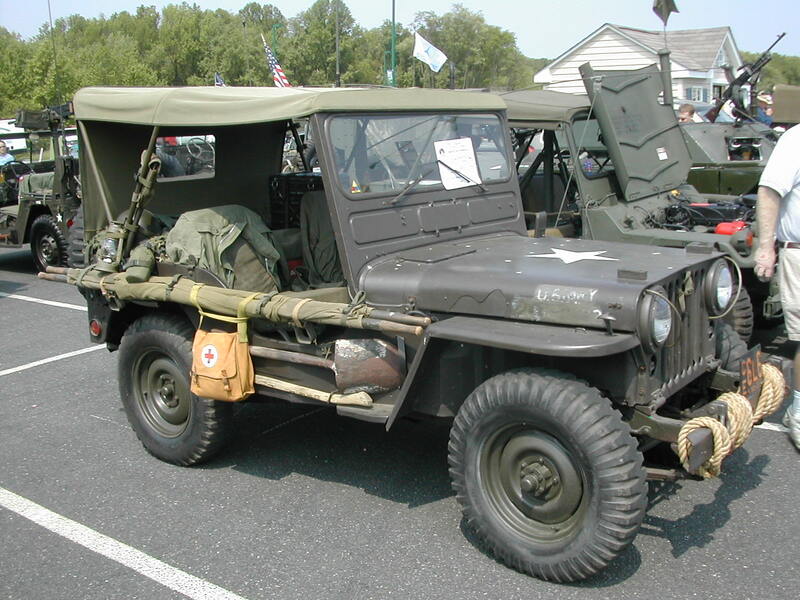 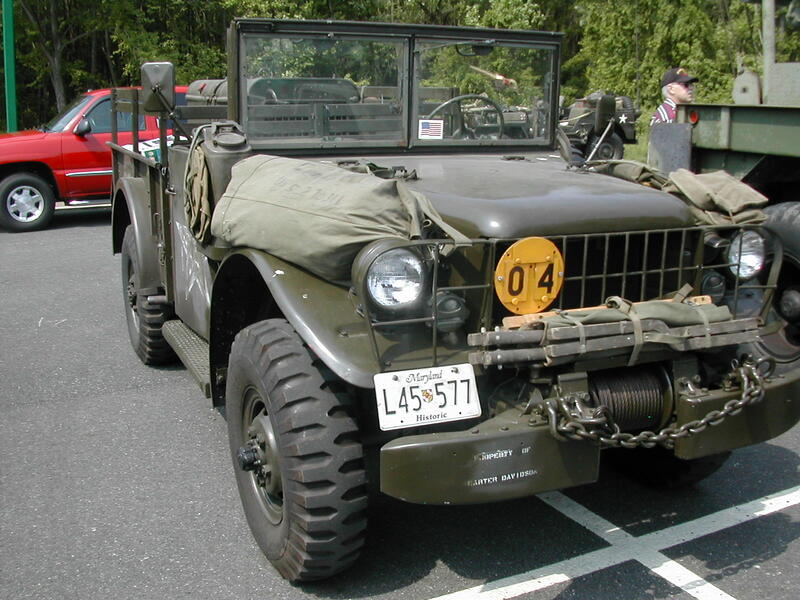 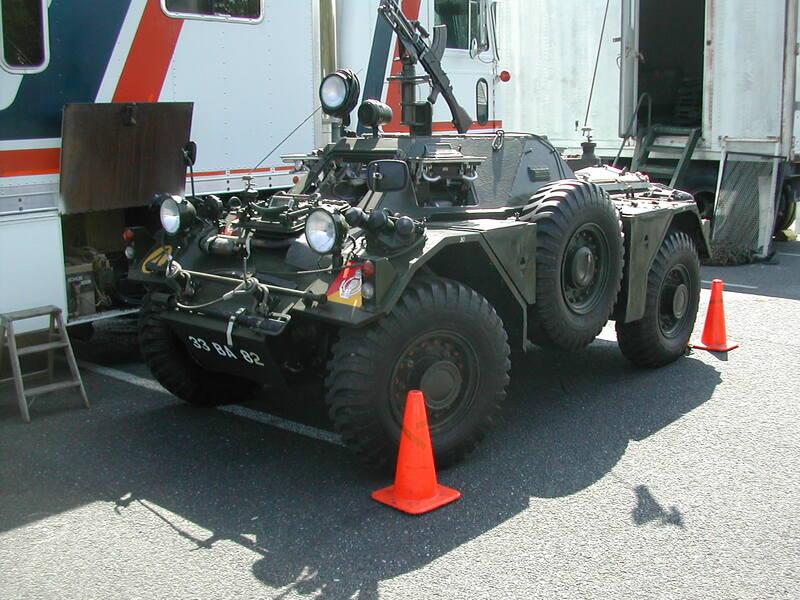 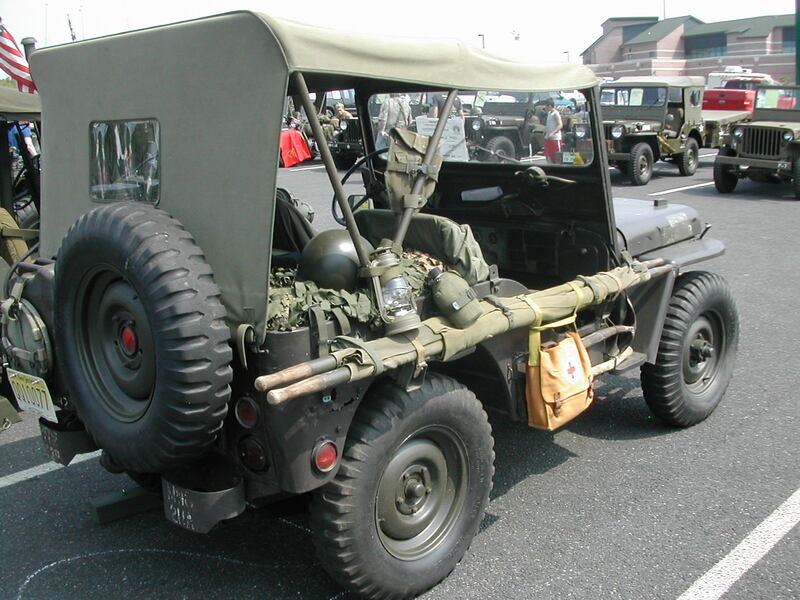 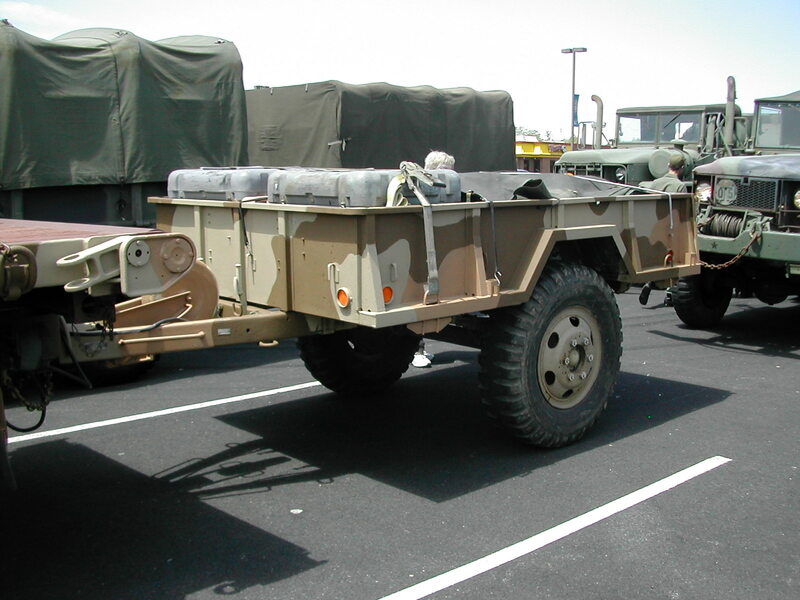 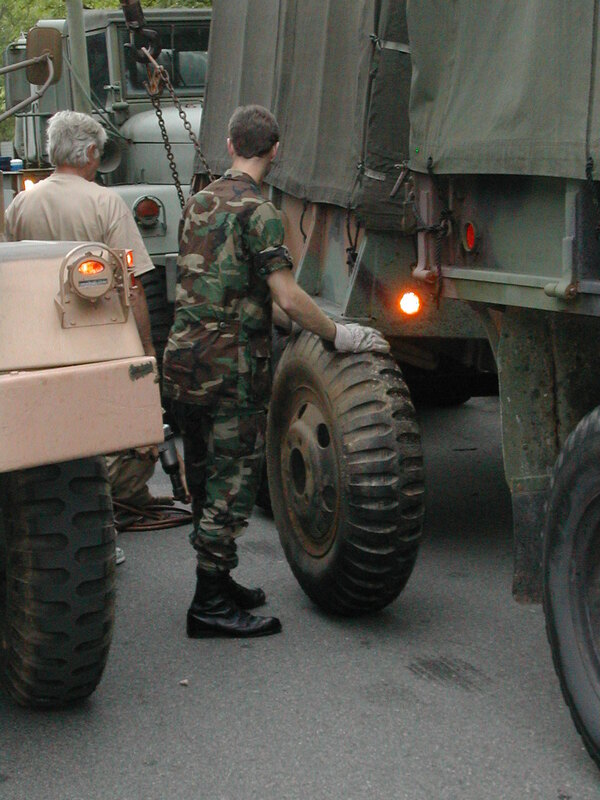 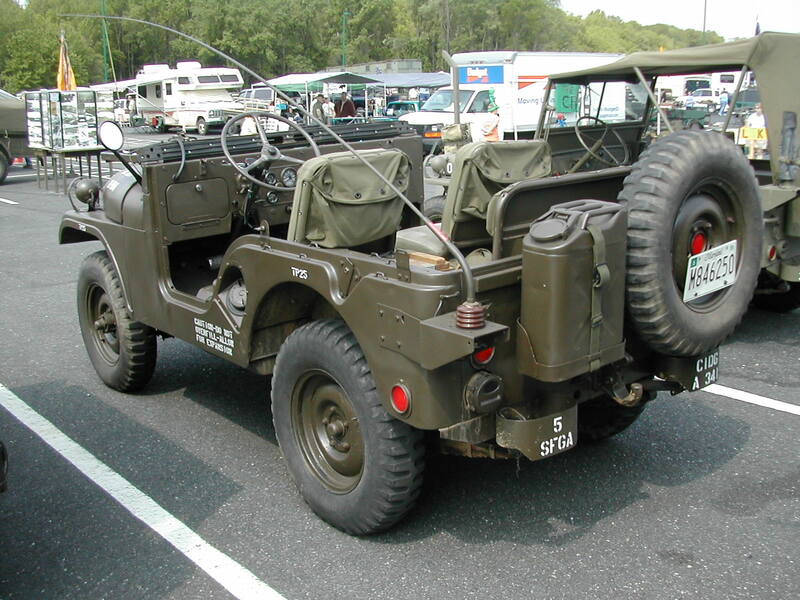 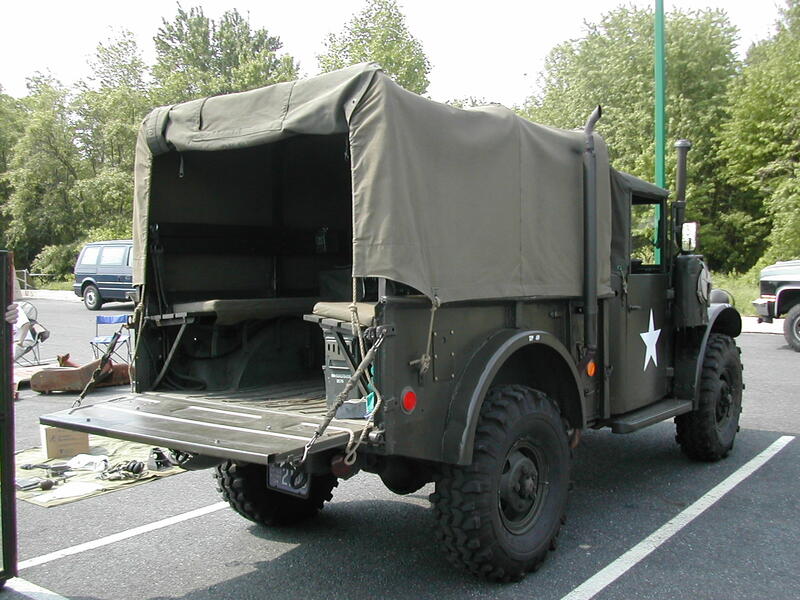 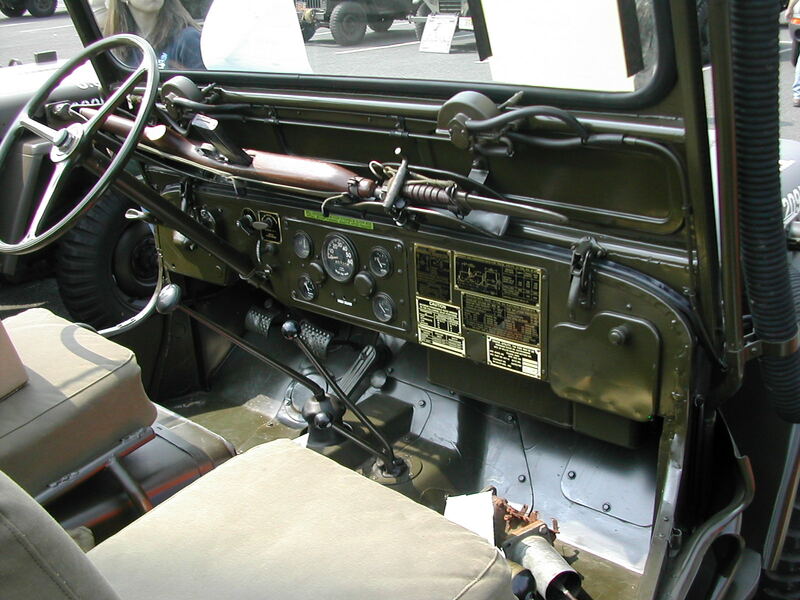 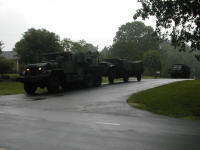 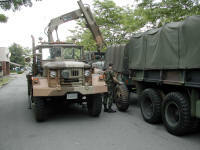 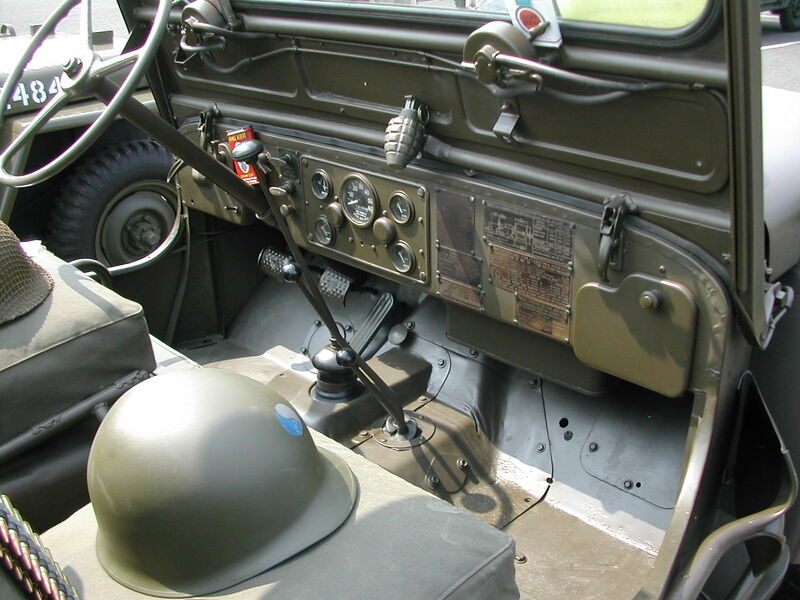 The convoy consisted of military vehicles (and a few civilian ones for good measure) from WWII through the present and drivers came from as far north as Canada and from as far south as Florida with the westernmost driver hailing from Nevada. 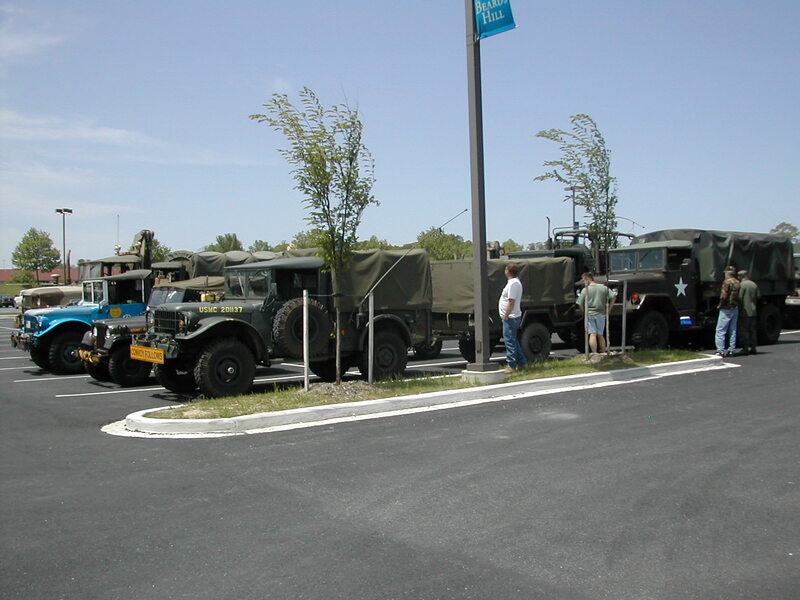 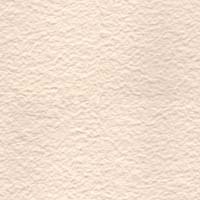 As in the past, I drove up with the Southern Serial from the south and left Raleigh at 3:00pm on Wednesday afternoon headed north to the truck stop in Henderson, NC where I planned to meet the fellows from the western portion of the state. Once Brandon and Jamie arrived (Brandon in his M816 wrecker and Jamie in Brandon's M35A2C with M105 trailer in tow), we headed north on I85 toward Doswel (Richmond), VA. 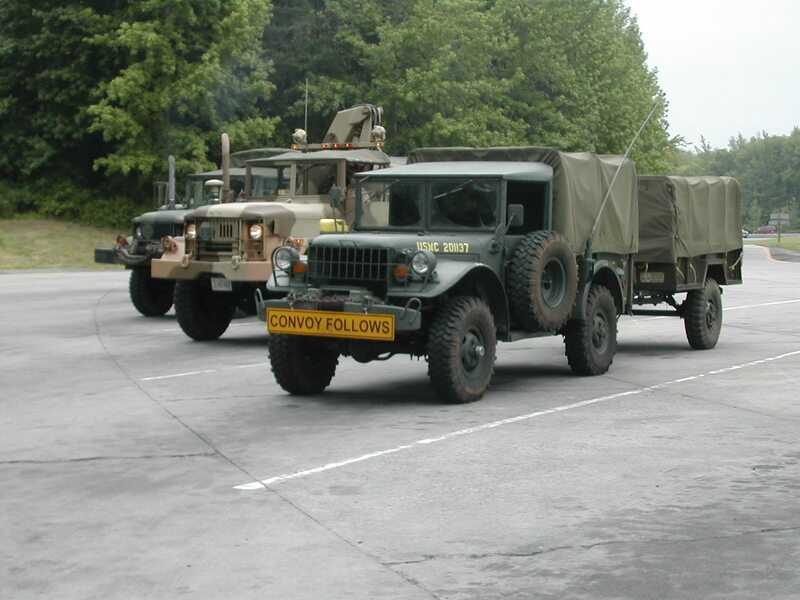 The trip up was smooth, except that when I hit the off ramp for the exit in Doswell where we planned to spend the night, I lost the two guys following me... 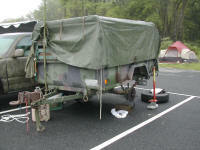 Turns out that Jamie had run out of fuel a mile before the exit, right when a semi tucked in between us... 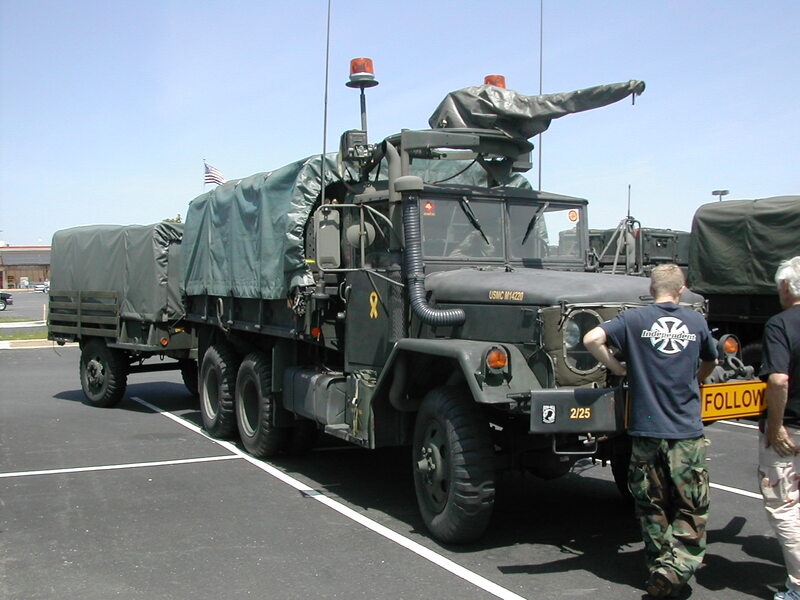 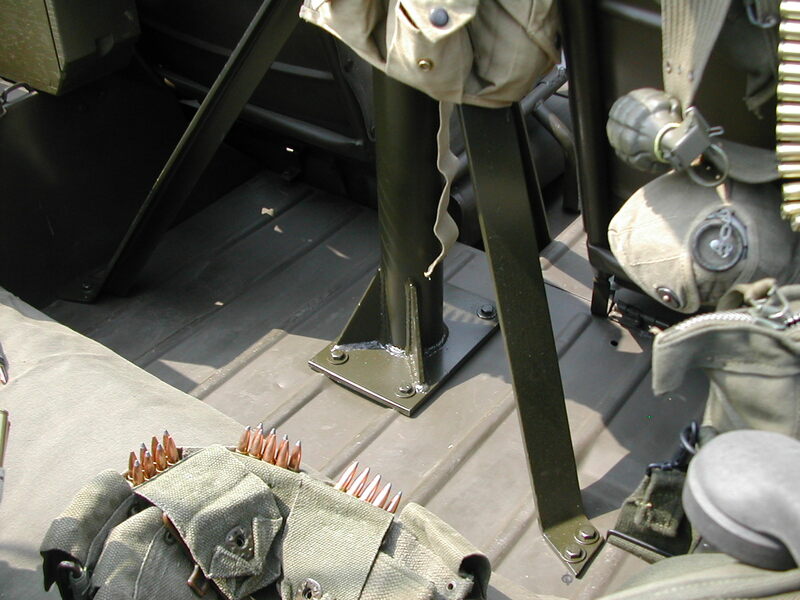 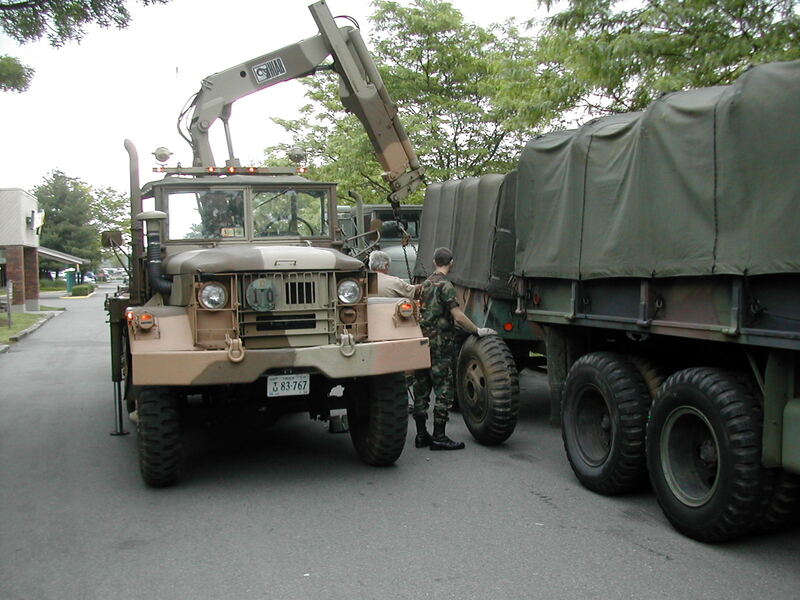 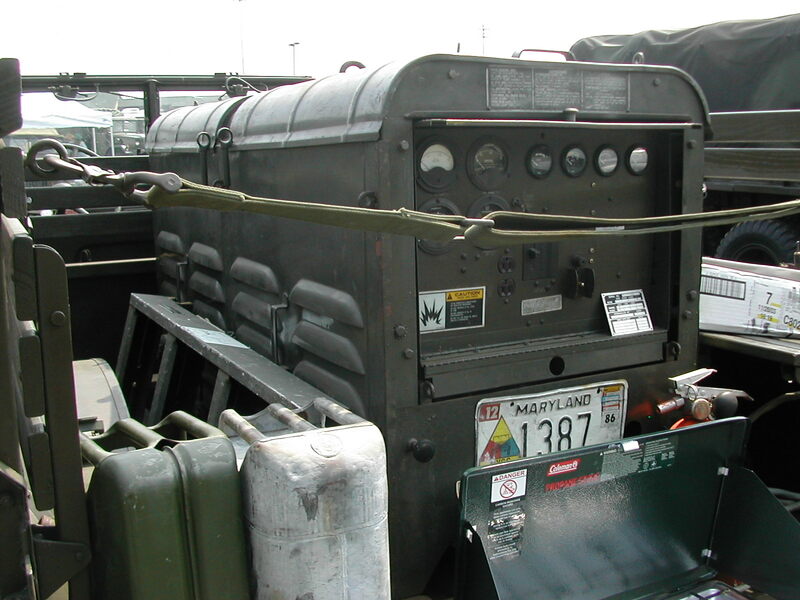 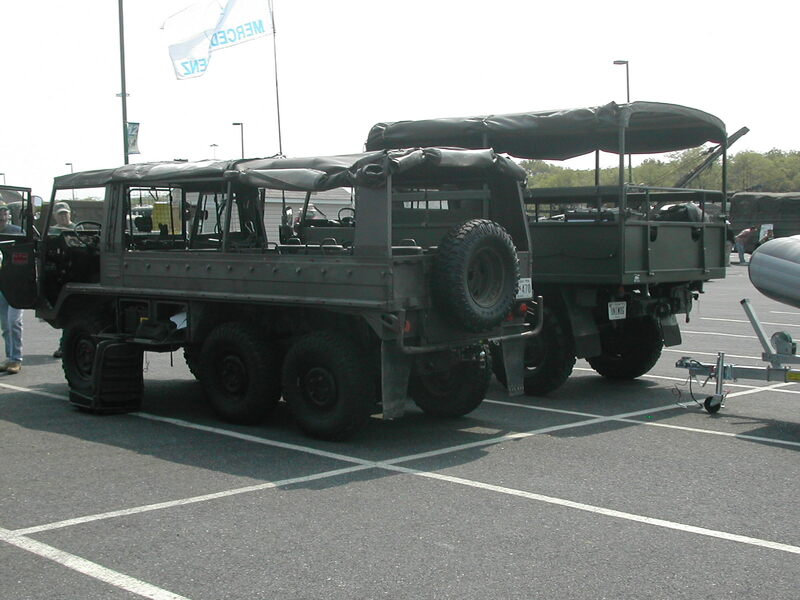 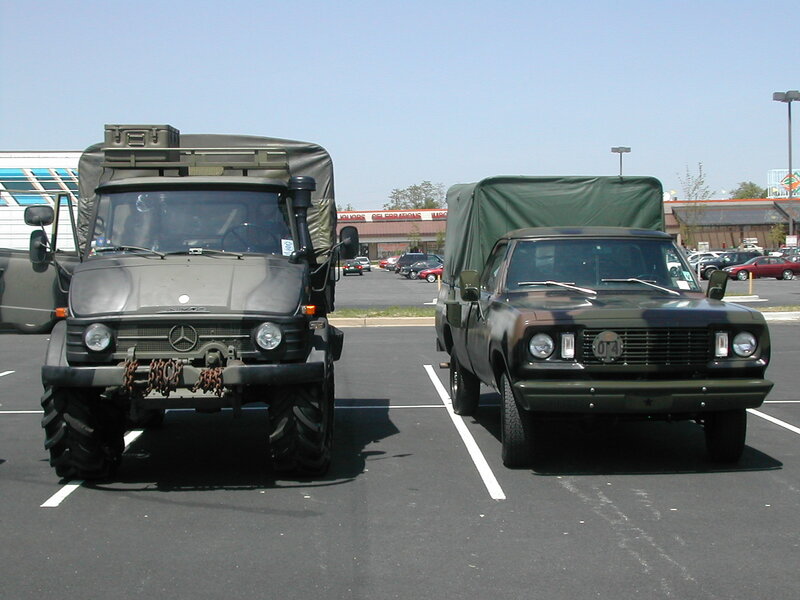 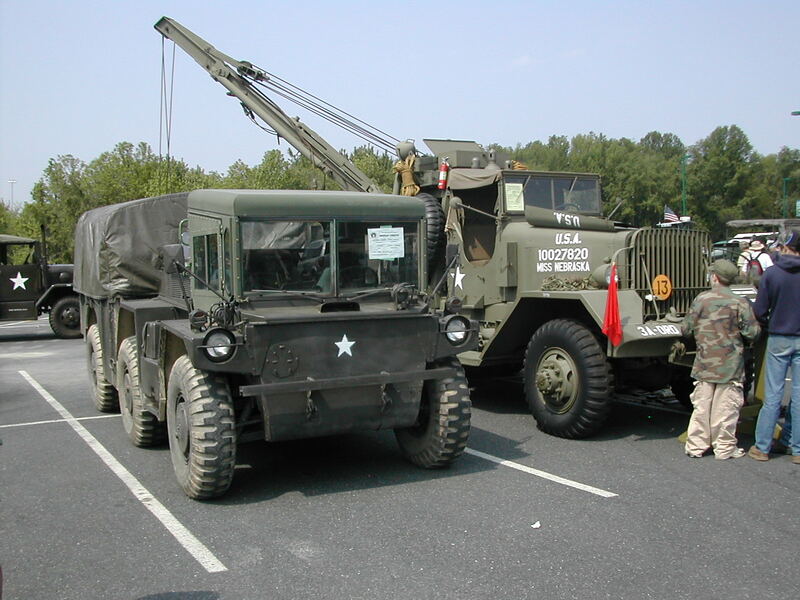 I spent a little while at the top of the ramp waiting for them to pull up (flat towing the M35a2c with the M816) and talking to Adrian about converting his M37 to diesel (using a GM6.2 engine from a HMWWV) since he and his father Bjorn had stopped to check on me when they spotted me sitting on the shoulder (Bjorn took the cranetruck M35 around the corner and checked into the hotel..). 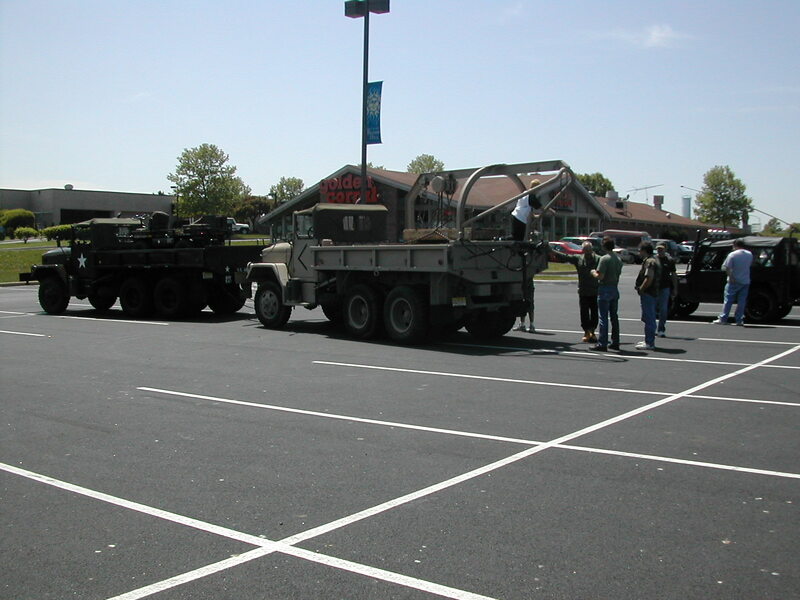 Just as we pulled into the truck stop across the street from the hotel parking lot, Kenny from Florida showed up in his 2.5 ton tractor with trailer and his son riding shotgun. 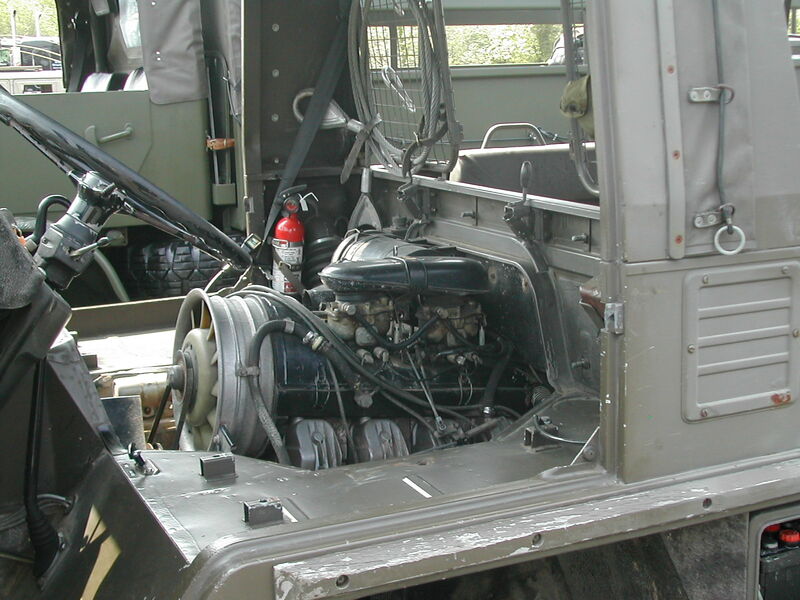 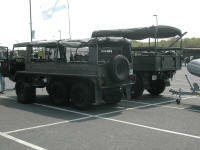 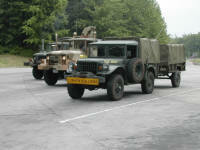 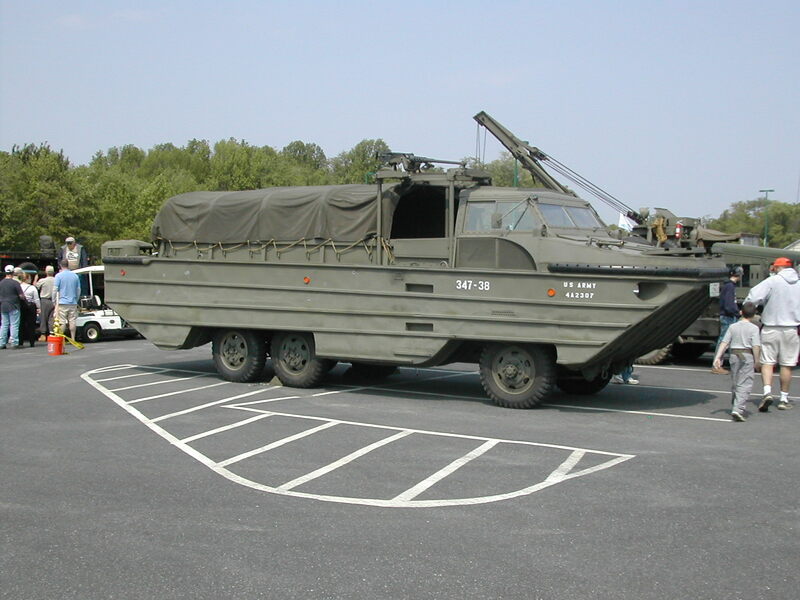 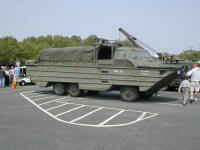 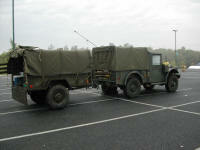 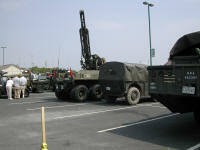 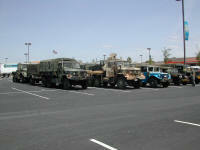 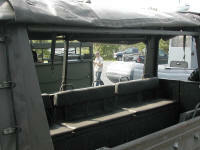 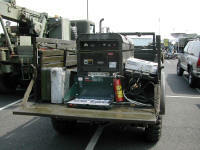 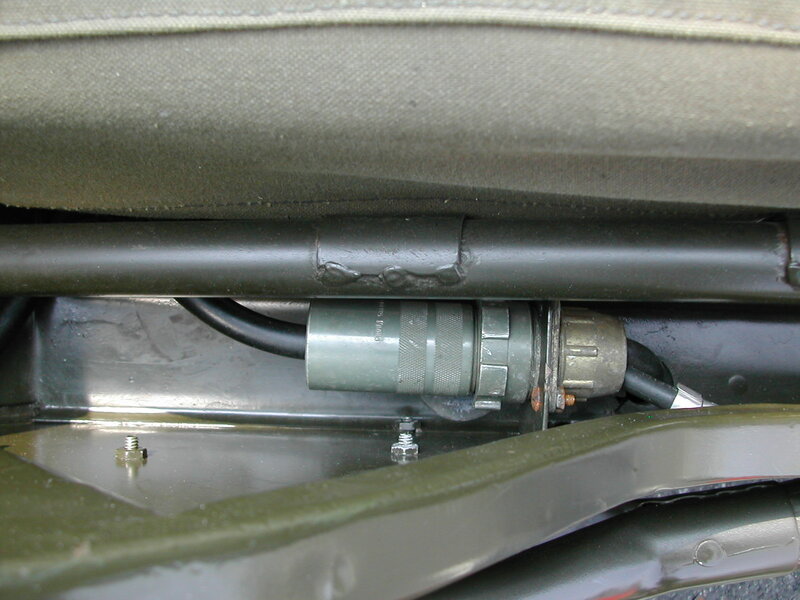 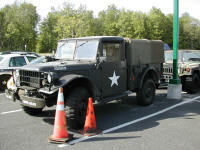 We decided to have supper at the Denny's located at the hotel and to worry about getting the M35A2C fired up afterward. After supper, it took us a little while to bleed the air out of the deuce's fuel lines, but she fired right up and ran like a dream the rest of the way up to Aberdeen. 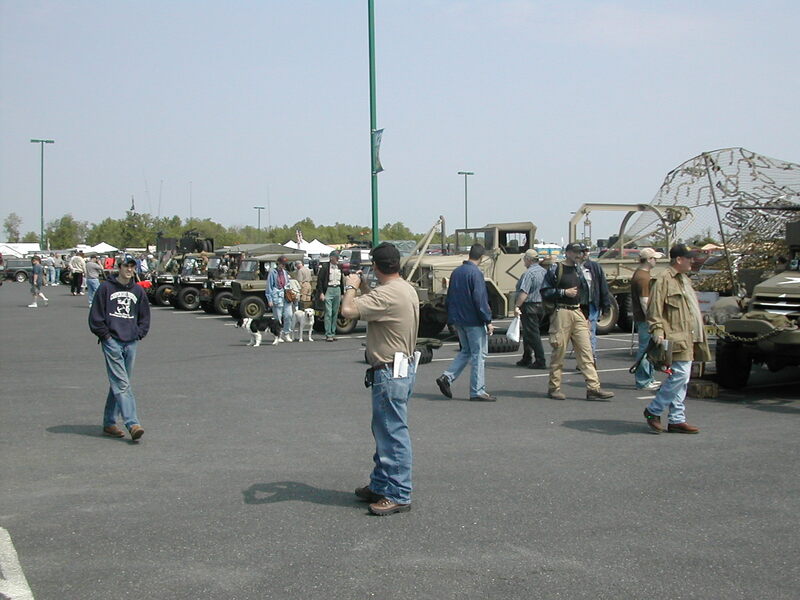 The Southern Serial arrived on time in Churchville, MD and only had a short wait (half hour or so) until the guys from the Northern Serials arrived as a group and we passed out the t-shirts and other goodies that our sponsors had donated. 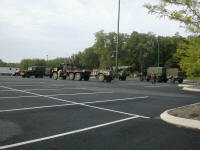 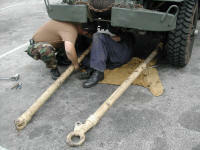 We then headed out as a massed column for Ripken Stadium and our final destination. 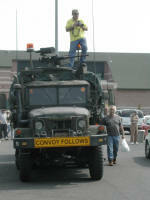 The Aberdeen MV show was outstanding. 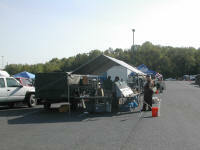 Place was sold out and there seemed to be plenty of variety in vendor stock. 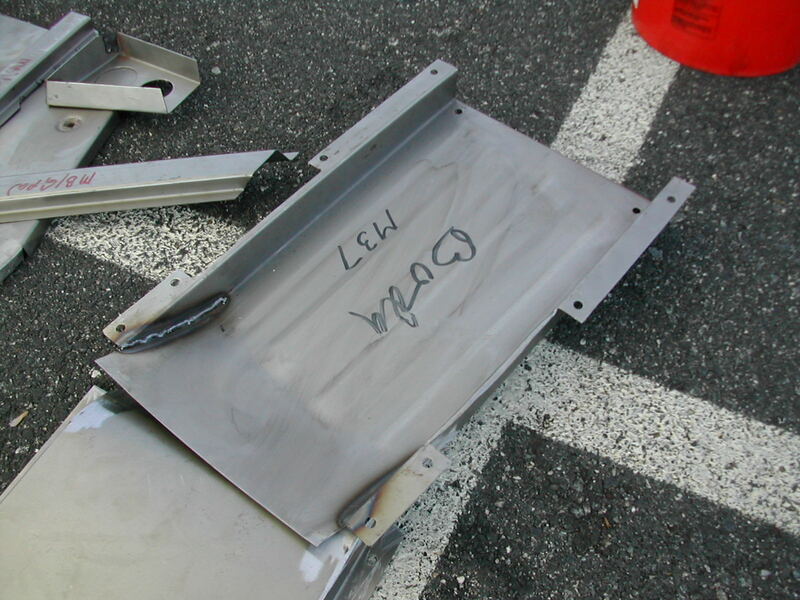 I spent the weekend socializing (met quite a few folks whom I had only corresponded with on the internet, made lots of new friends, and renewed friendships with others), eating (Carter drove over in his M37 and cooked hotdogs for lunch on Friday and Saturday this year and we did the community cooking in the southern area for most meals), drinking (never underestimate the power of a military discount at the liquor store, even if the only guy in uniform is at the register twenty feet away), and in buying/trading parts (came back with the same amount of stuff in the truck, but most of it was new to me...). 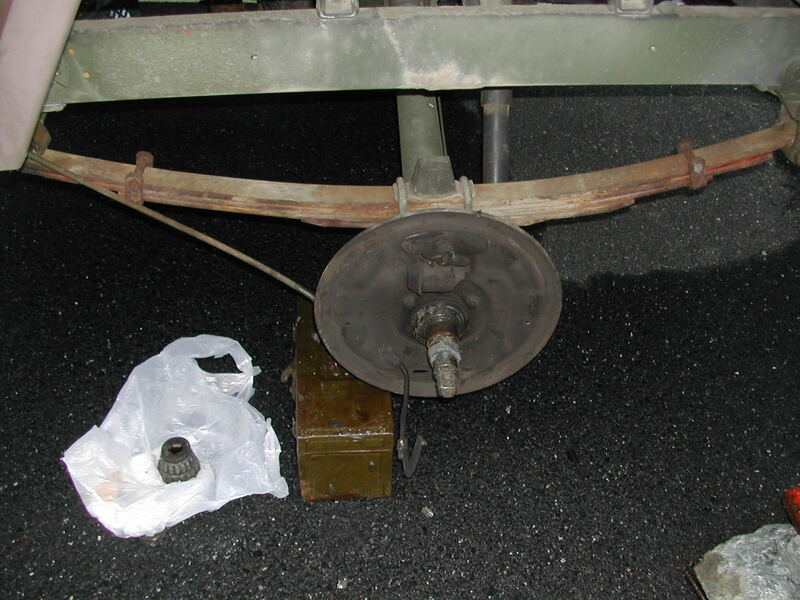 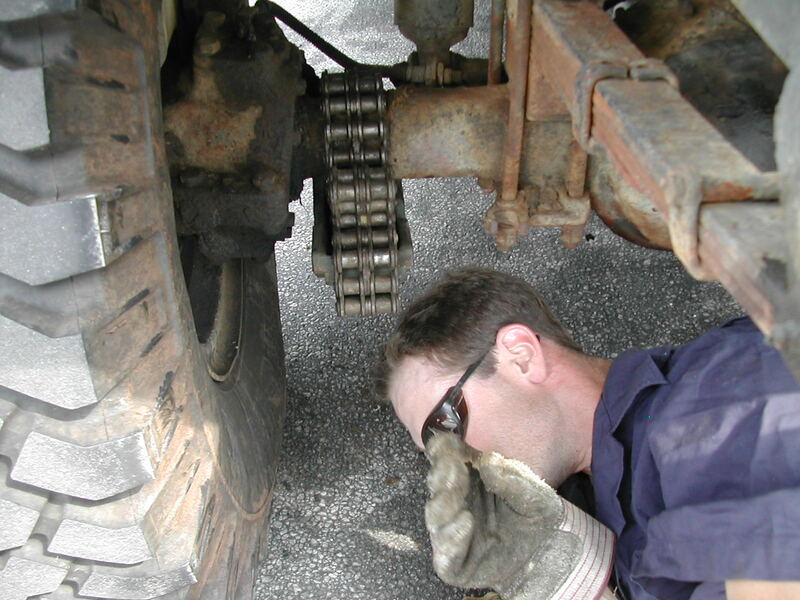 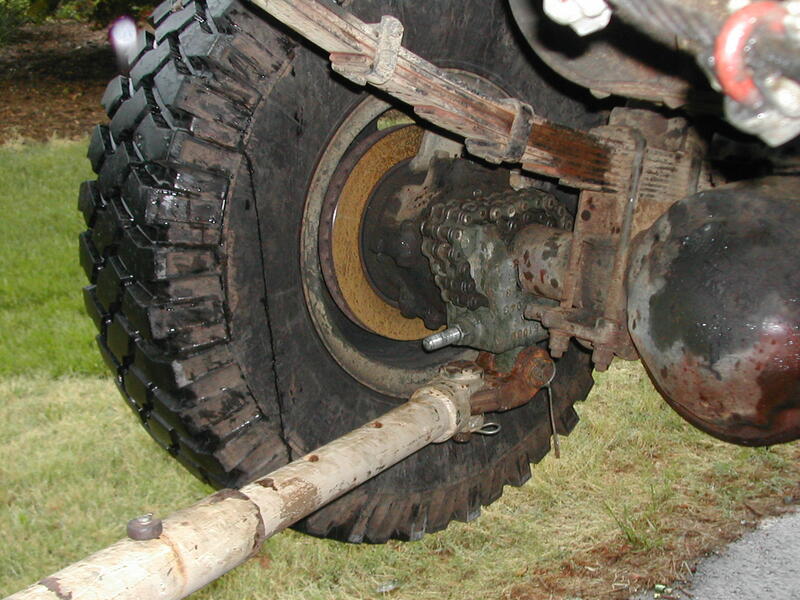 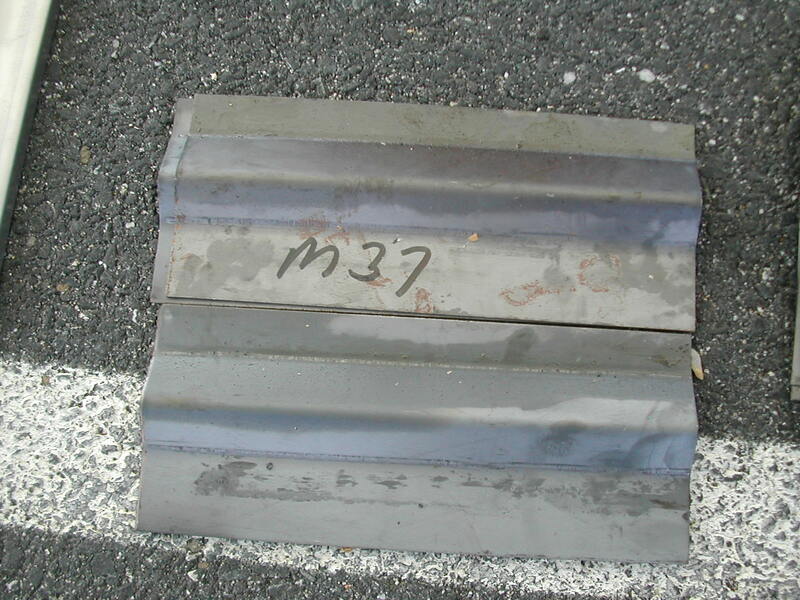 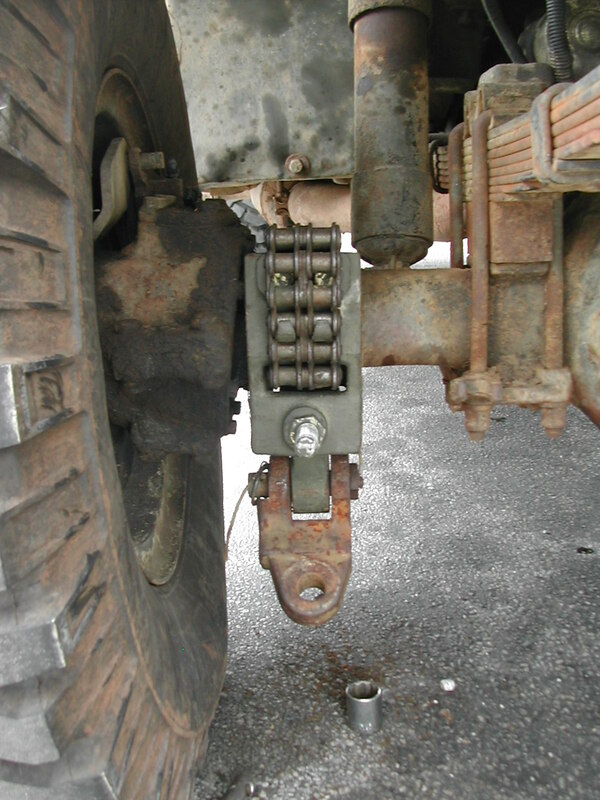 When we left the restaurant in Doswell on Sunday afternoon (same one we ate at on the way up), we noticed that one of the tires on the M105 trailer was flat. 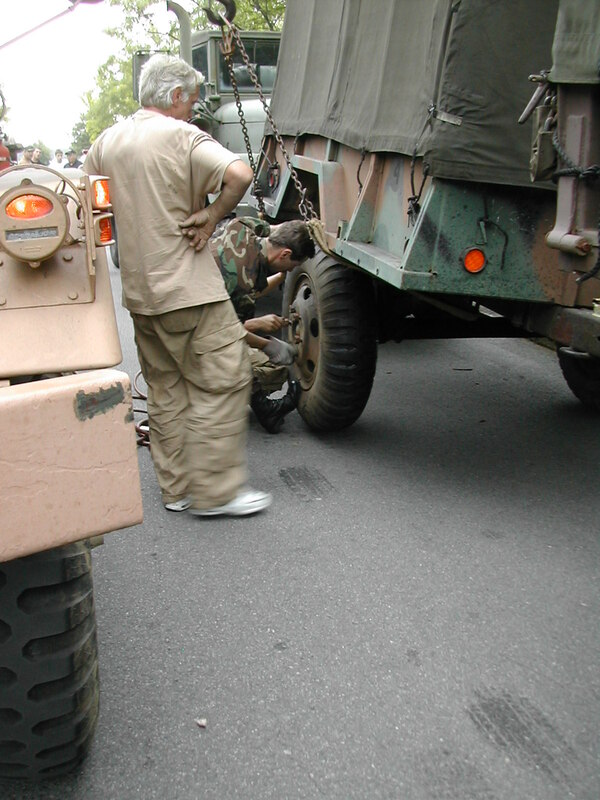 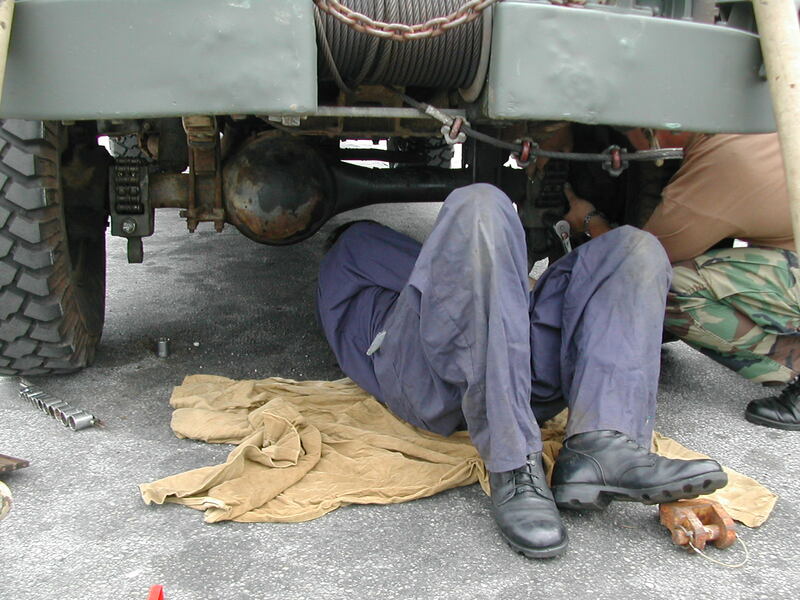 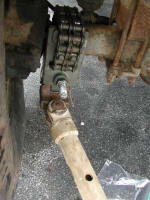 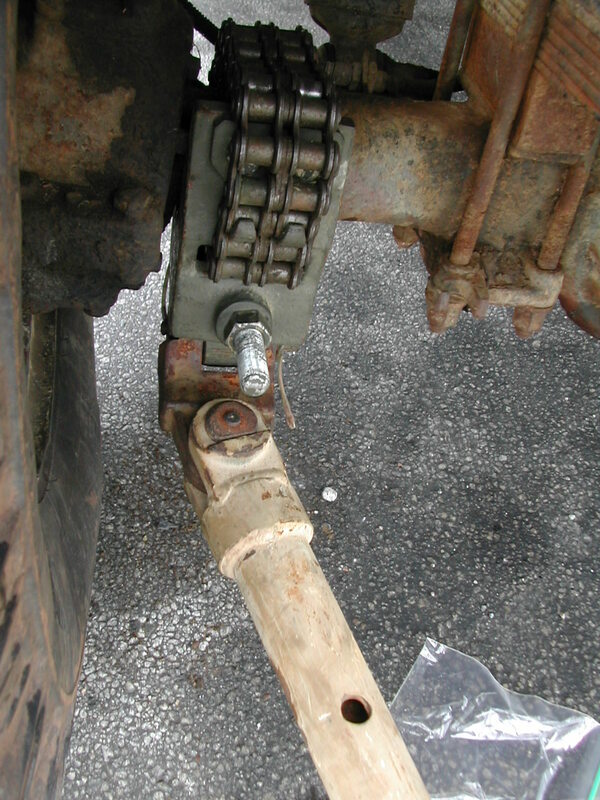 Turns out that it had picked up a sizeable nail along the route and had decided to loose all its air while we ate... With the aid of the cranetruck's knuckleboom, air tools, and experienced operators, the tire was changed for the spare carried on Brandon's M35A2 in only ten minutes..
Got home, unhooked the M37 and drove it across the street into my driveway and put it to bed while Jamie and Brandon headed west toward Morganton. 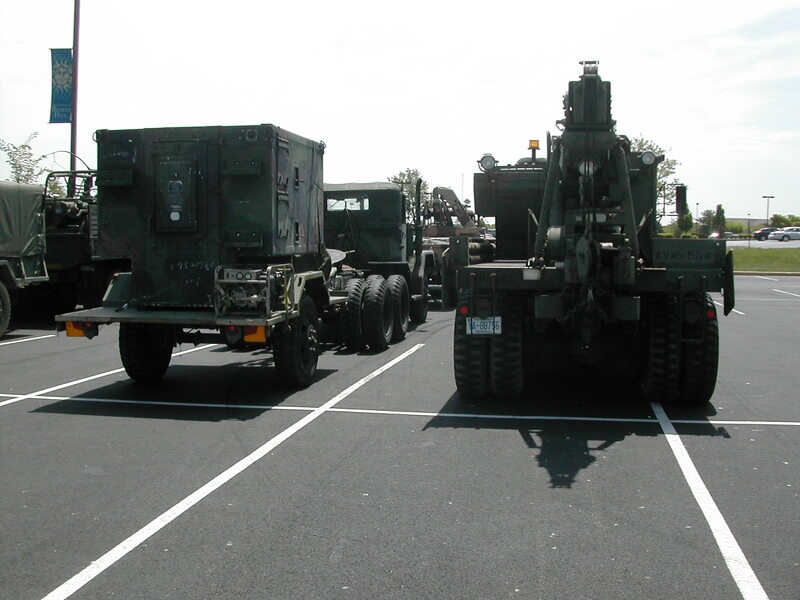 Heard from the guys the next day that the M35A2 lost its clutch in Clemmons, so it ended the trip getting towed by the M816 as well. 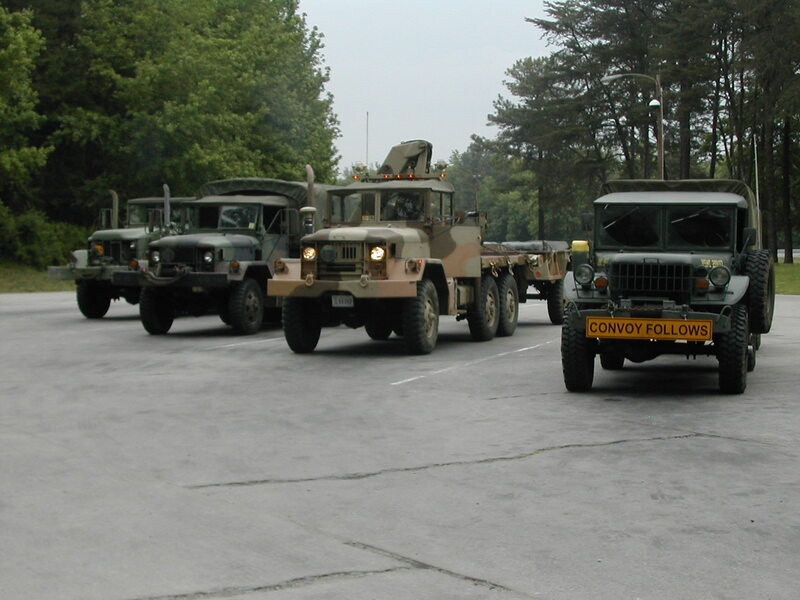 1 Convoy lineup in Aberdeen when the northern and southern serial groups meet prior to the combined drive to the stadium. 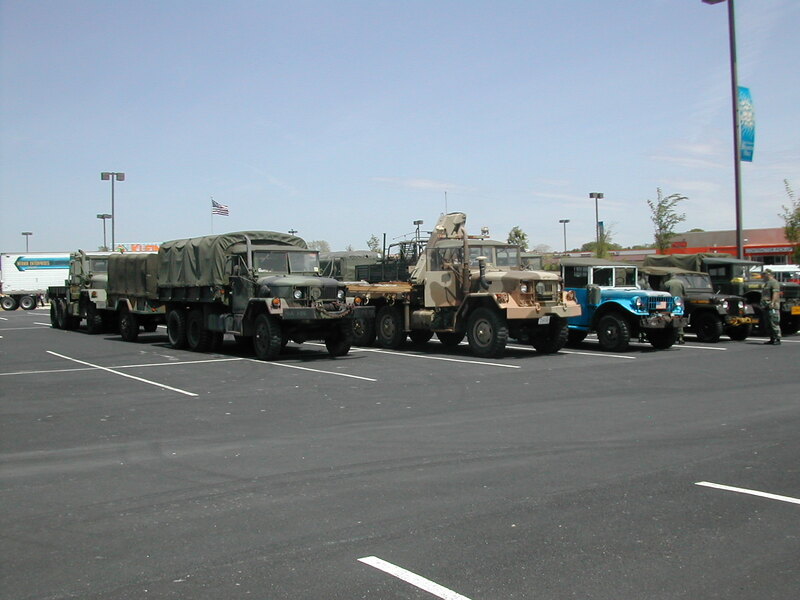 16-17 Convoy lineup in Aberdeen when the northern and southern serial groups meet prior to the combined drive to the stadium. 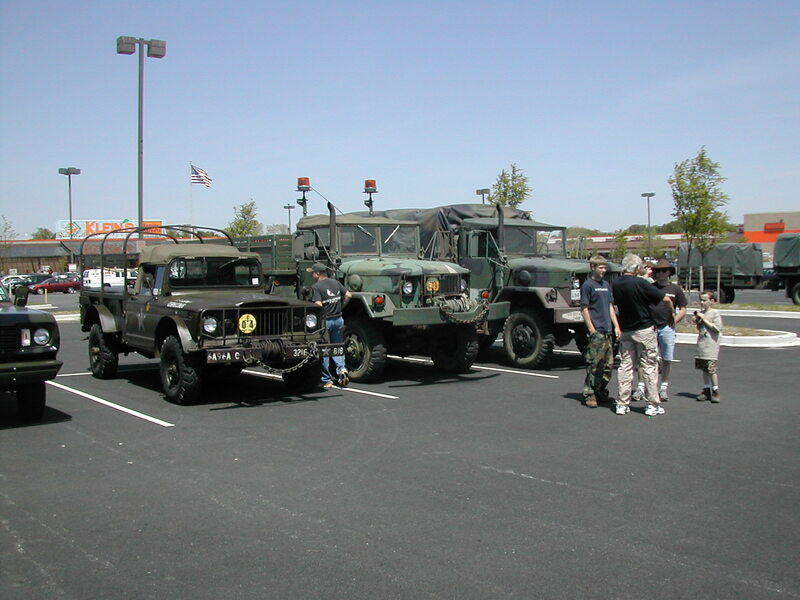 36 Convoy lineup in Aberdeen when the northern and southern serial groups meet prior to the combined drive to the stadium. 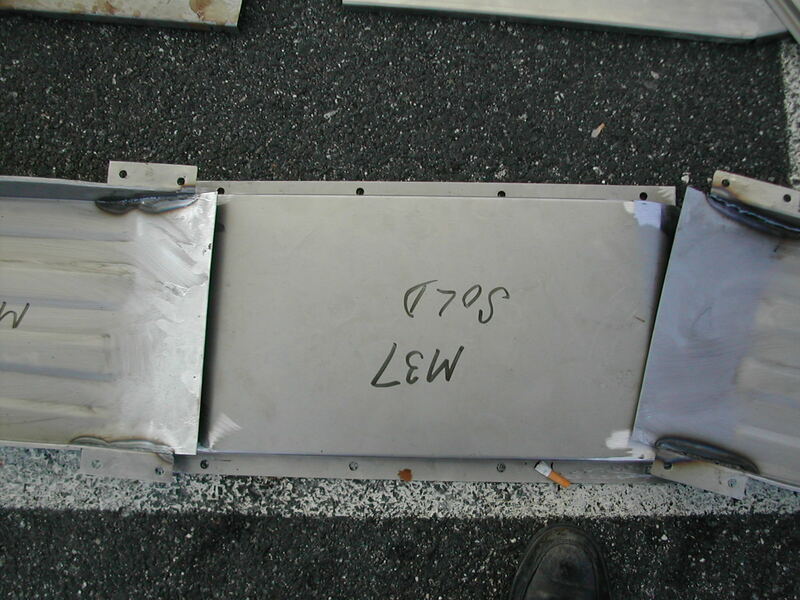 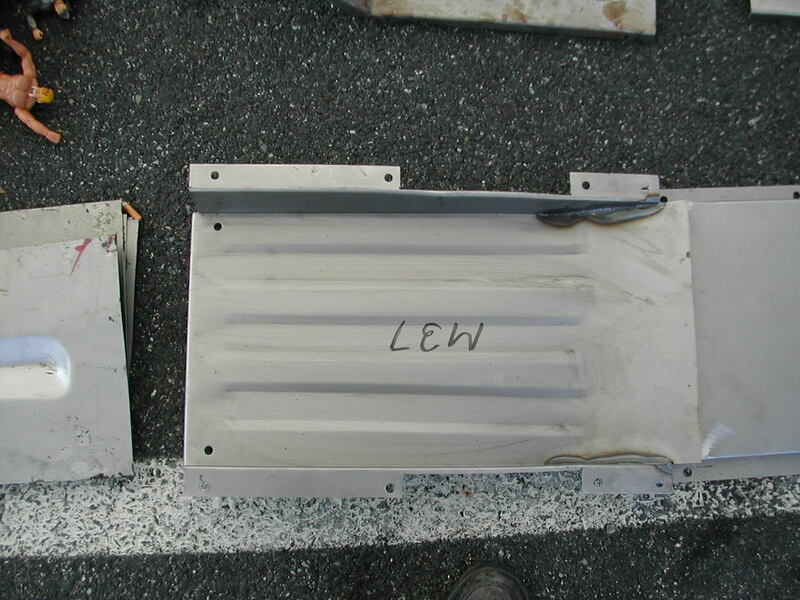 38-43 M37 tool box replacement panels from Sheldon at JeePanels Plus (another really great piece of workmanship at a reasonable price). 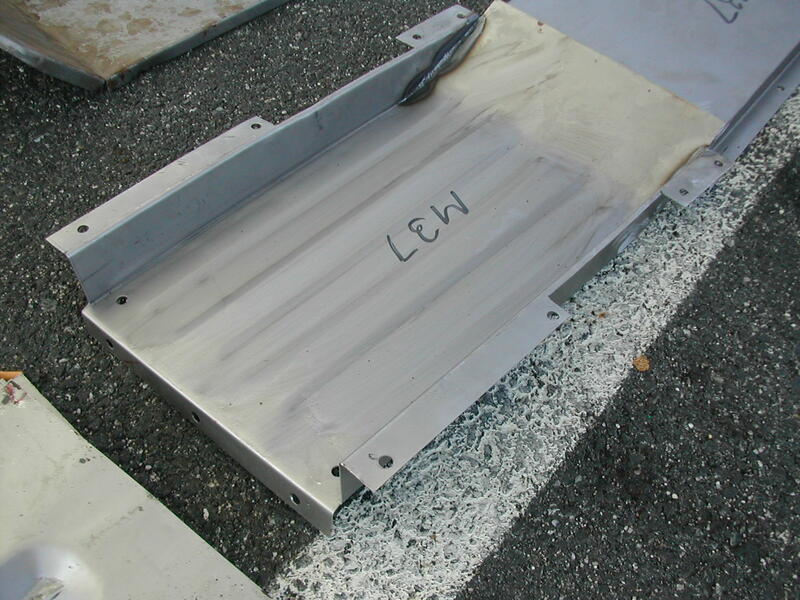 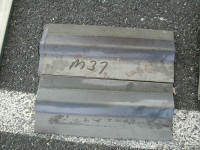 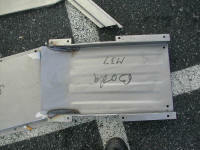 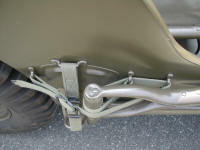 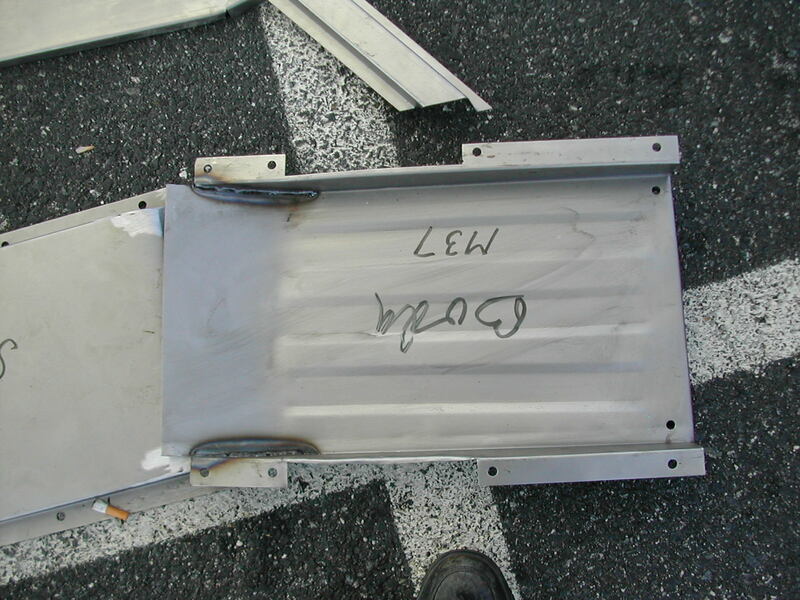 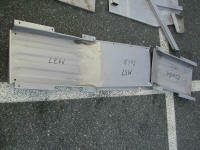 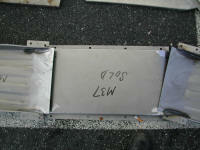 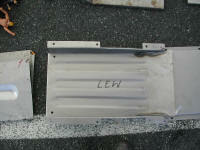 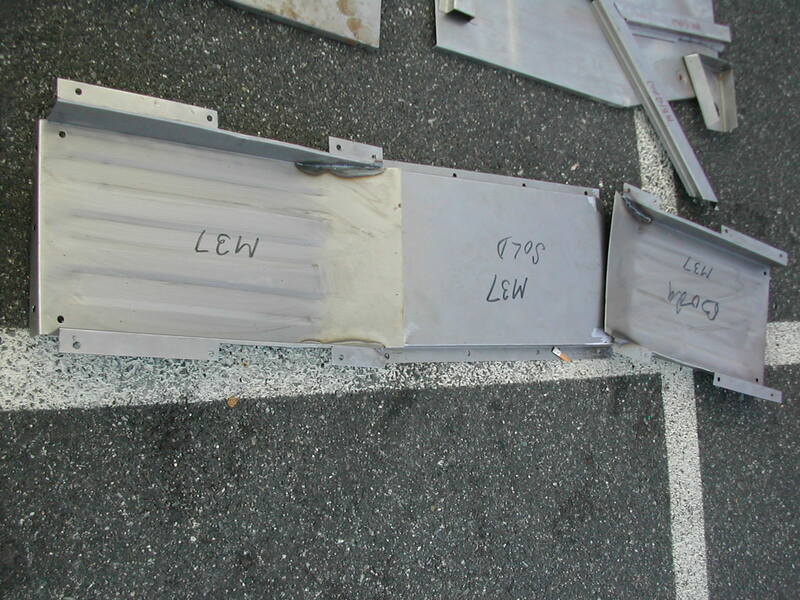 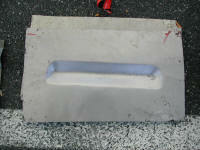 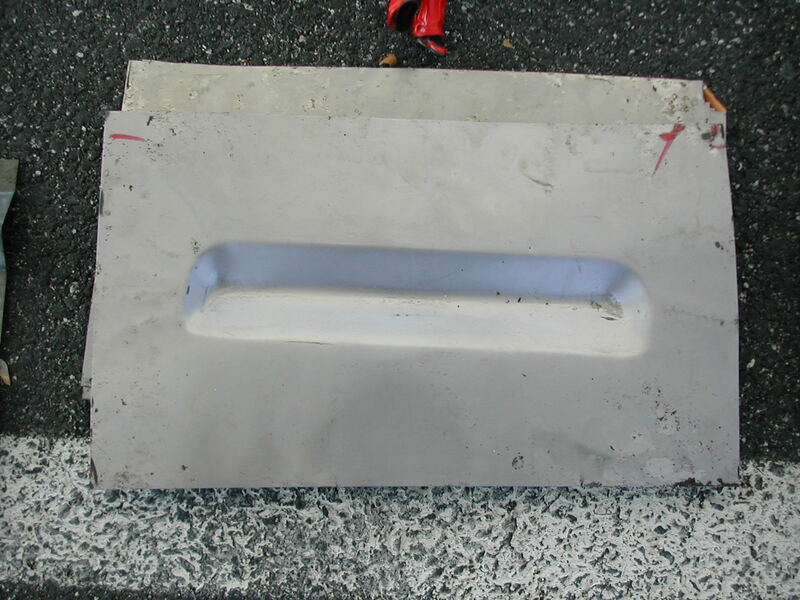 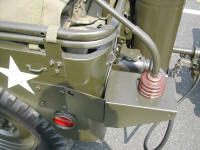 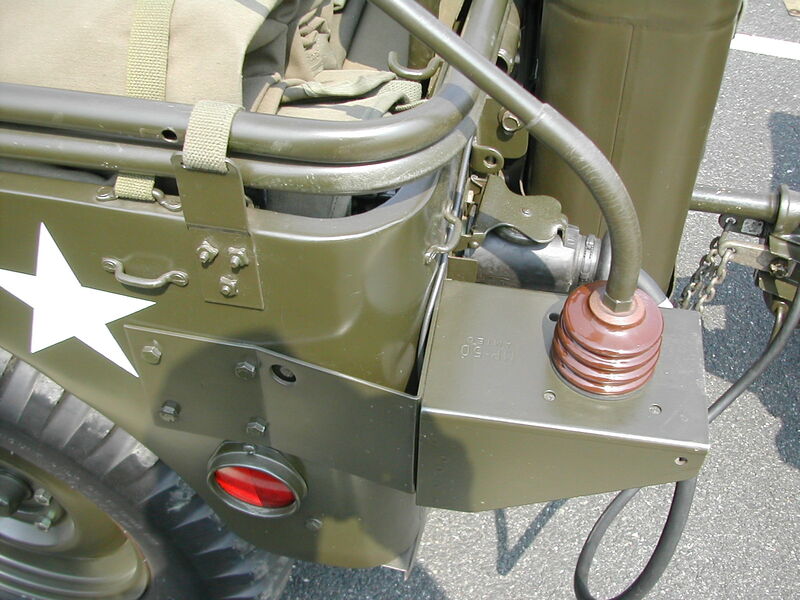 44-45 M37 front fender repair panel (goes under the headlight) from JeePanels Plus. 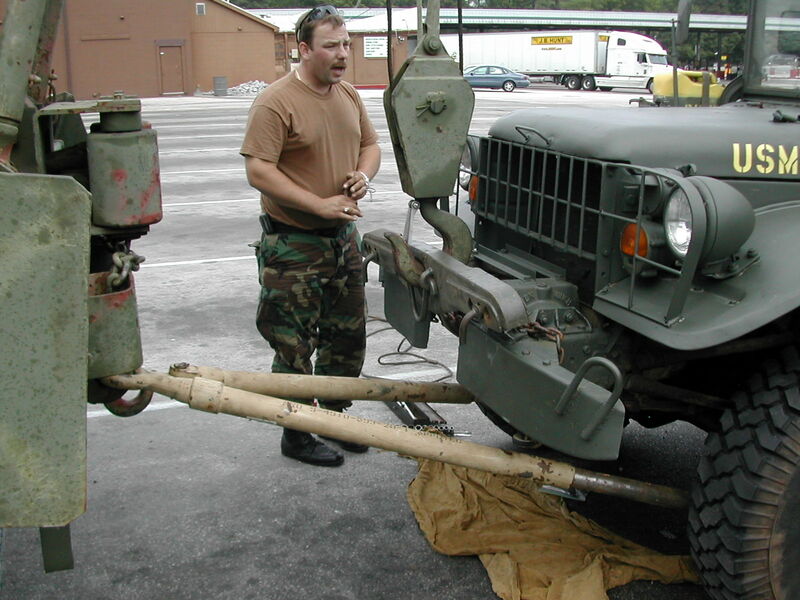 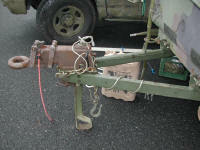 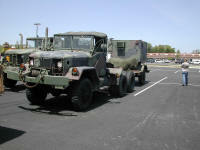 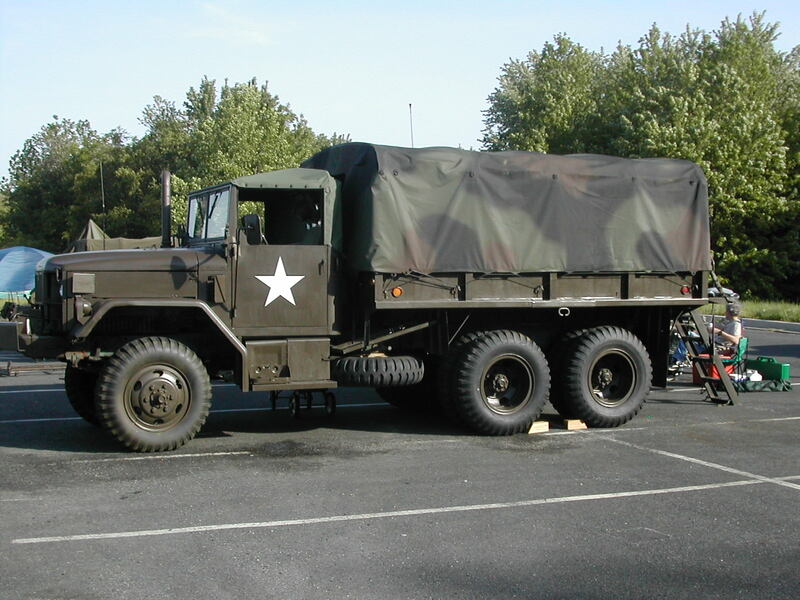 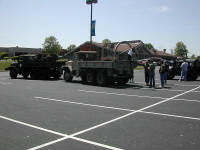 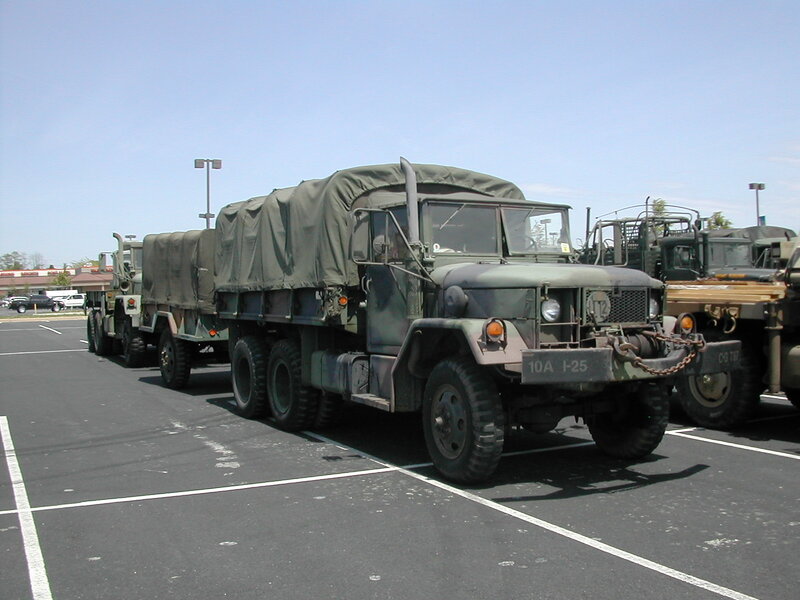 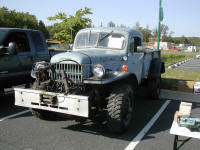 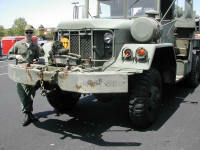 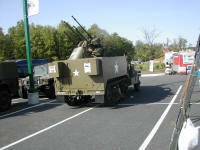 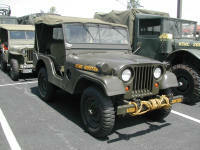 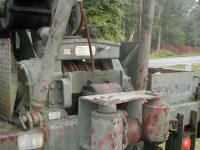 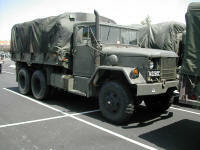 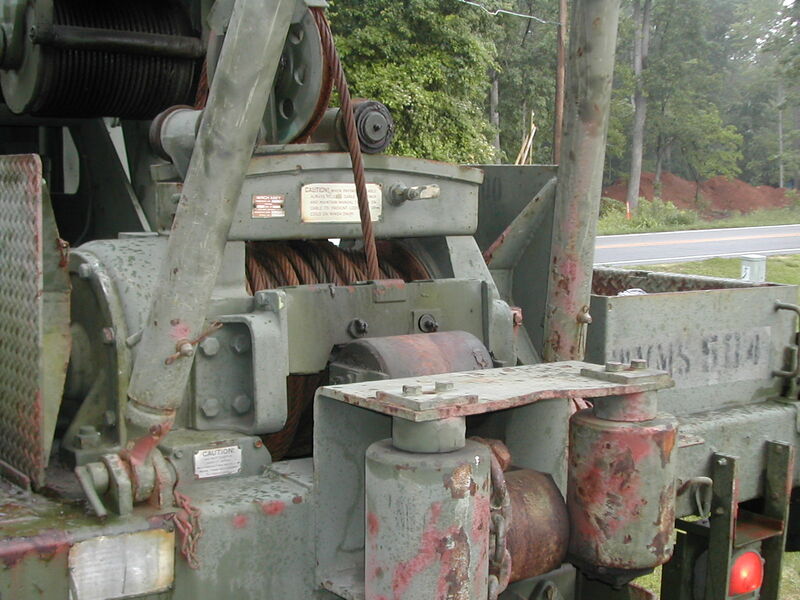 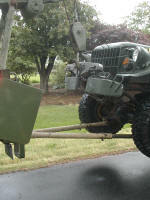 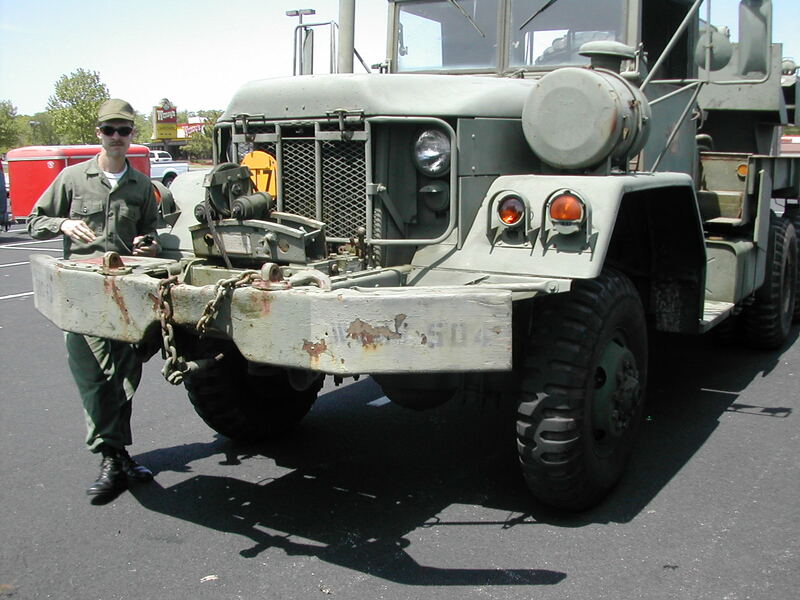 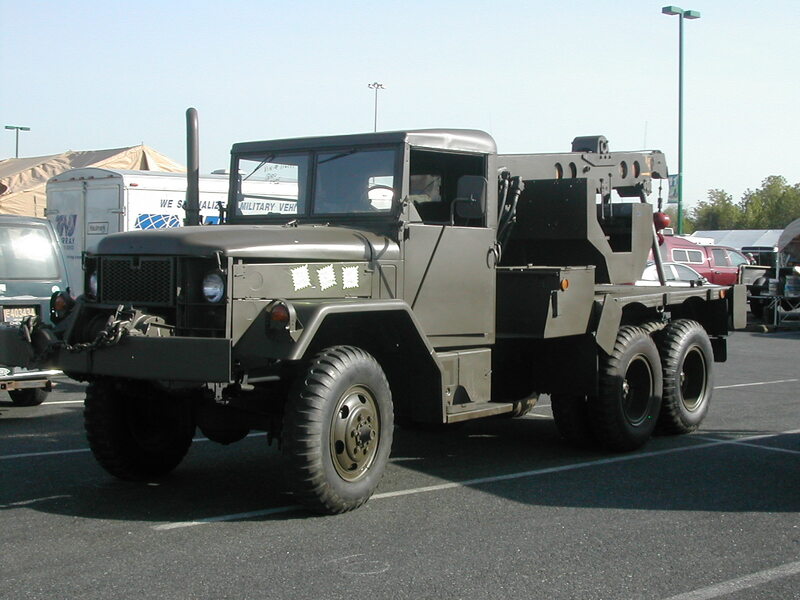 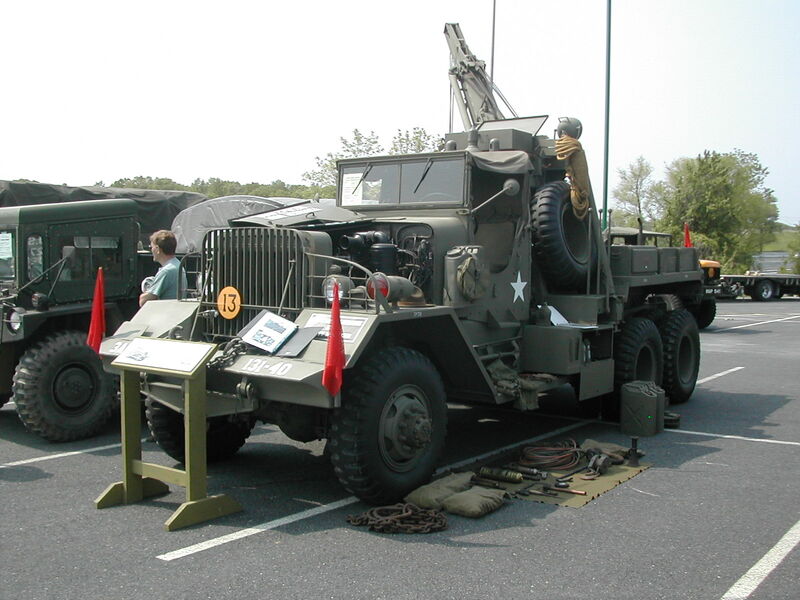 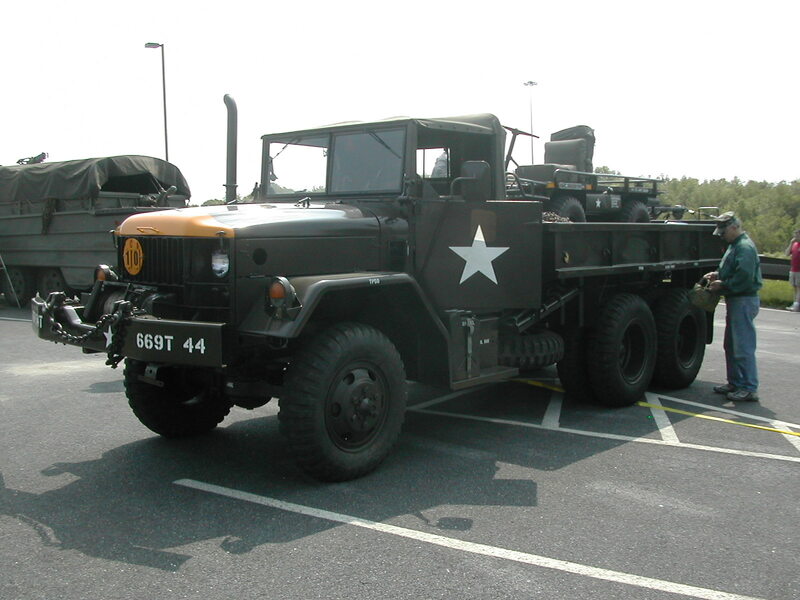 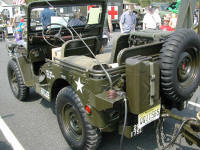 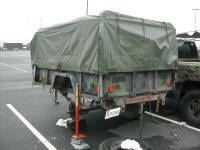 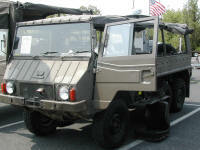 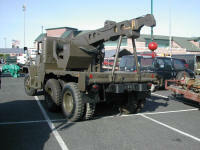 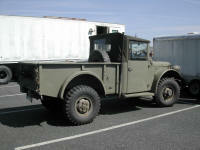 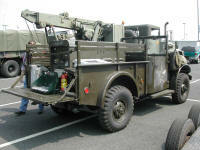 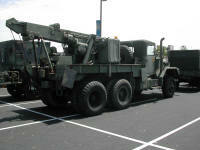 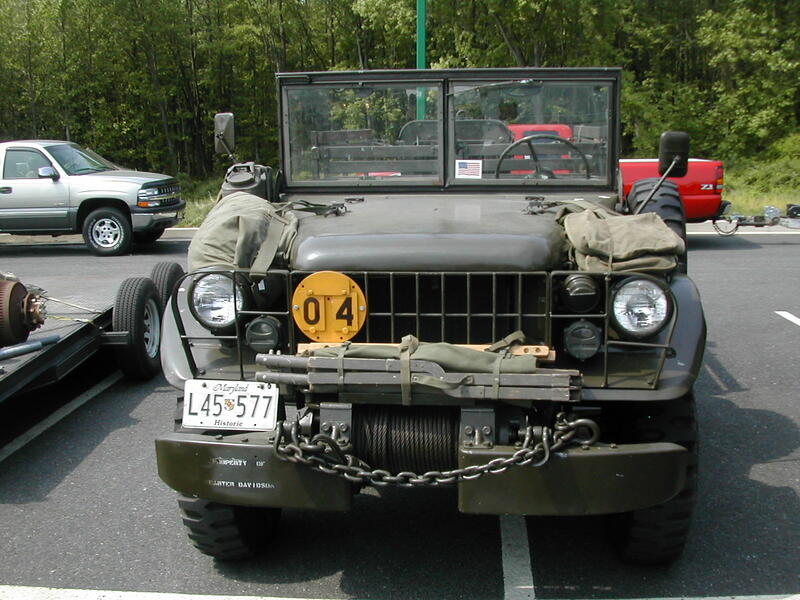 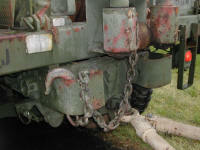 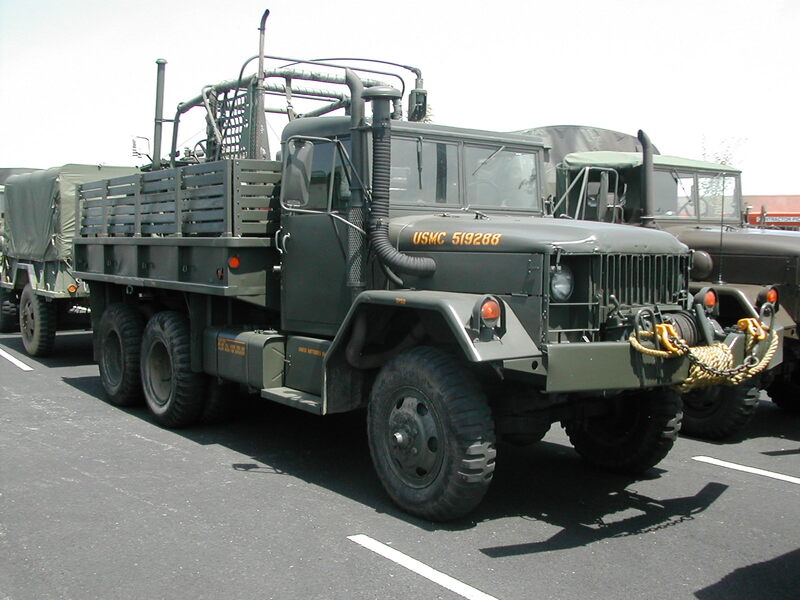 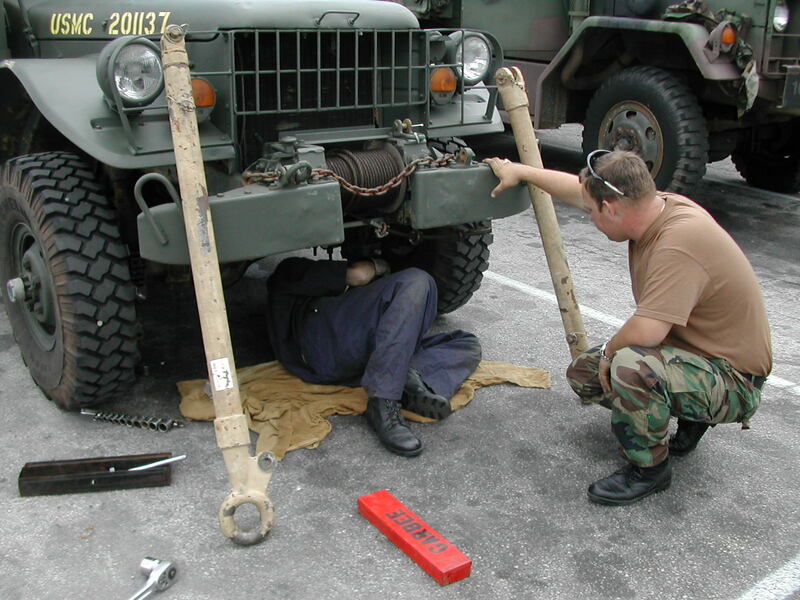 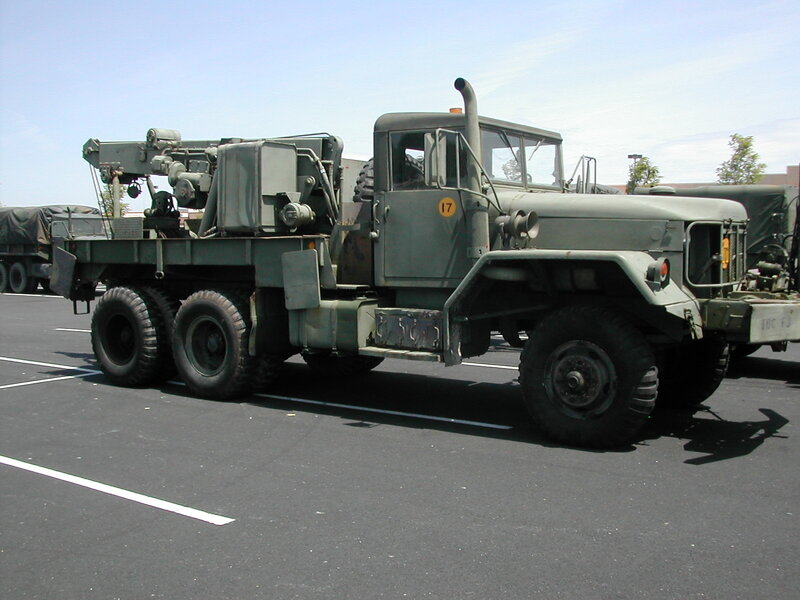 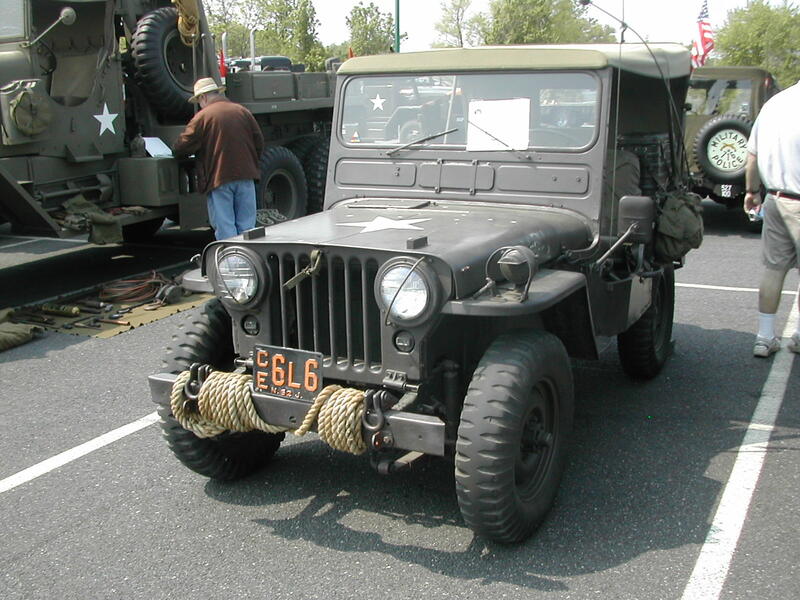 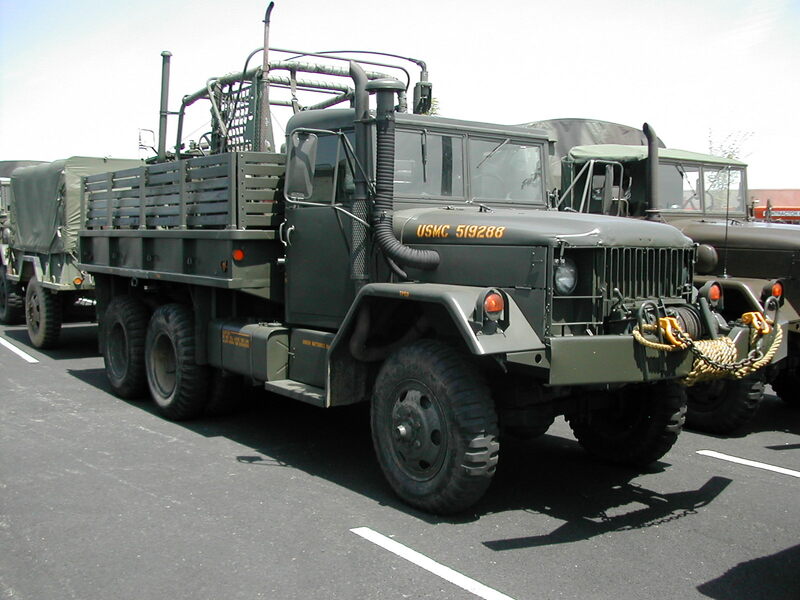 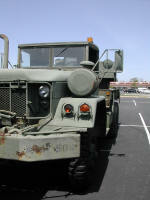 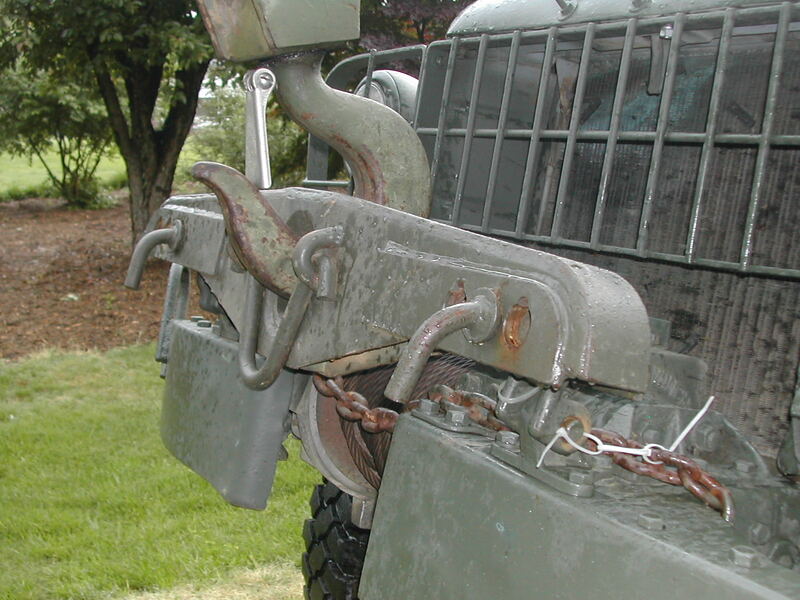 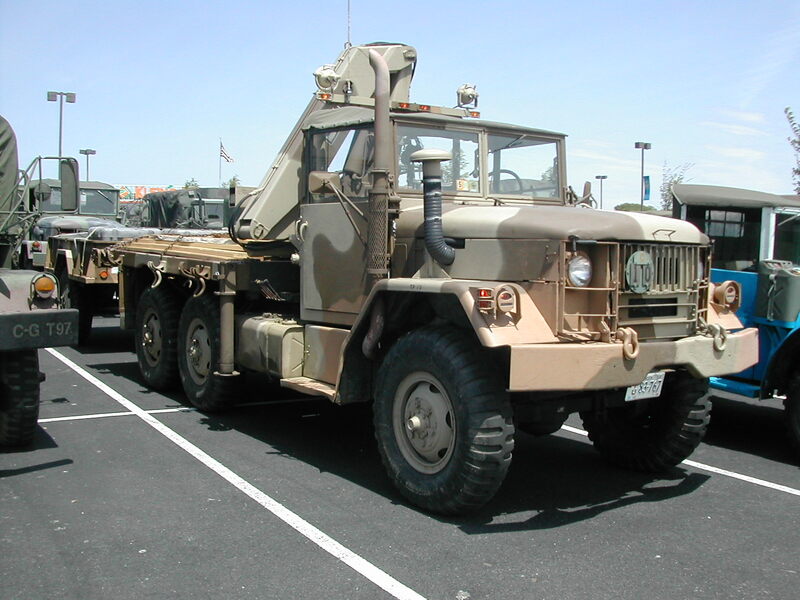 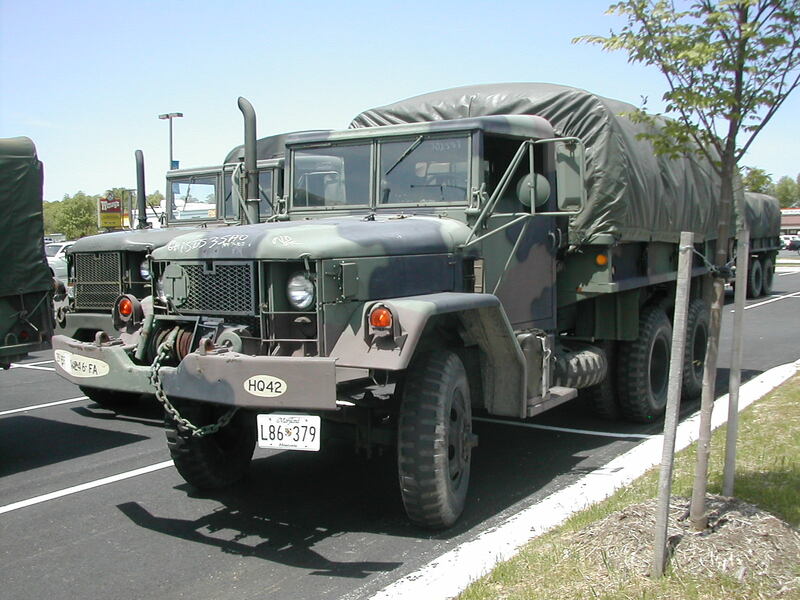 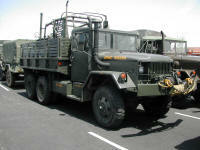 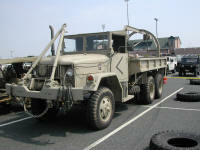 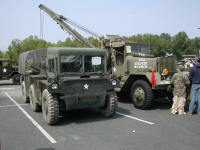 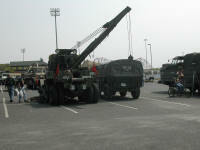 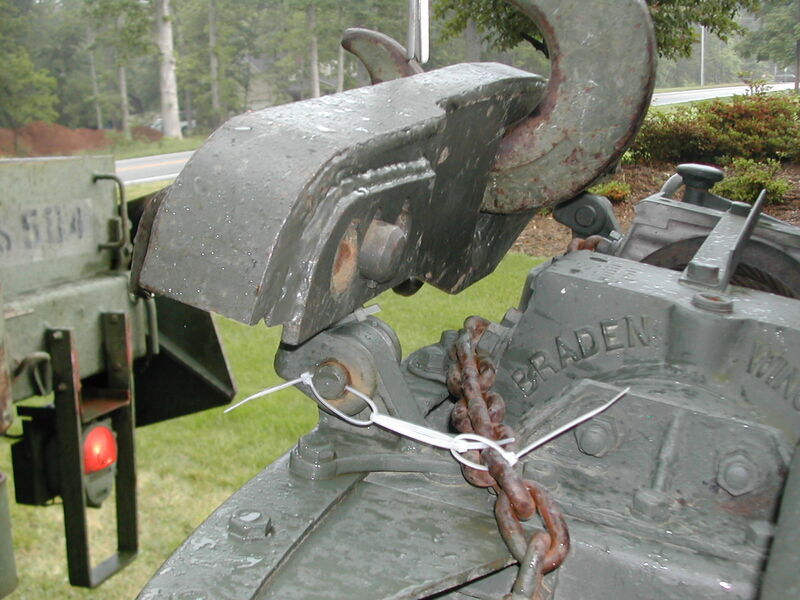 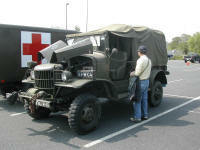 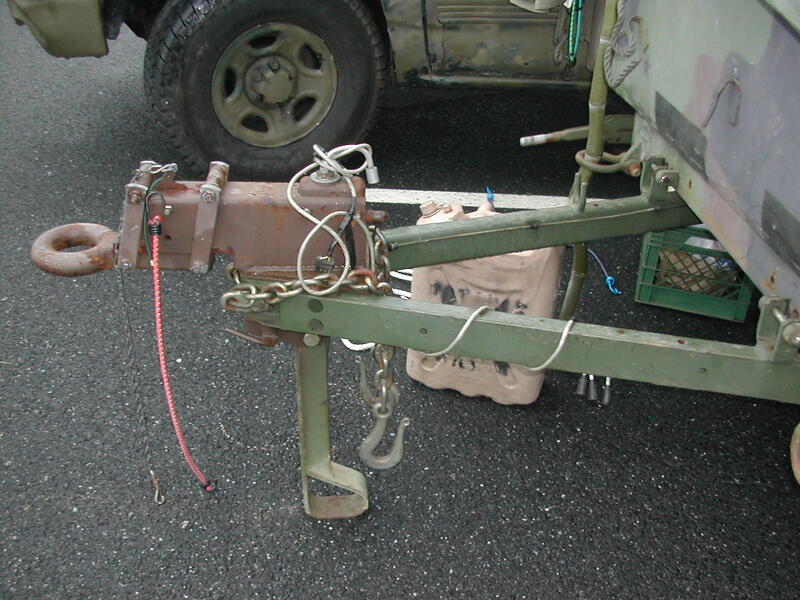 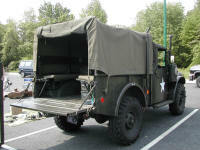 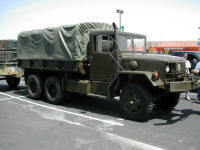 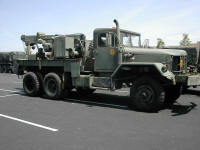 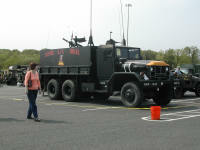 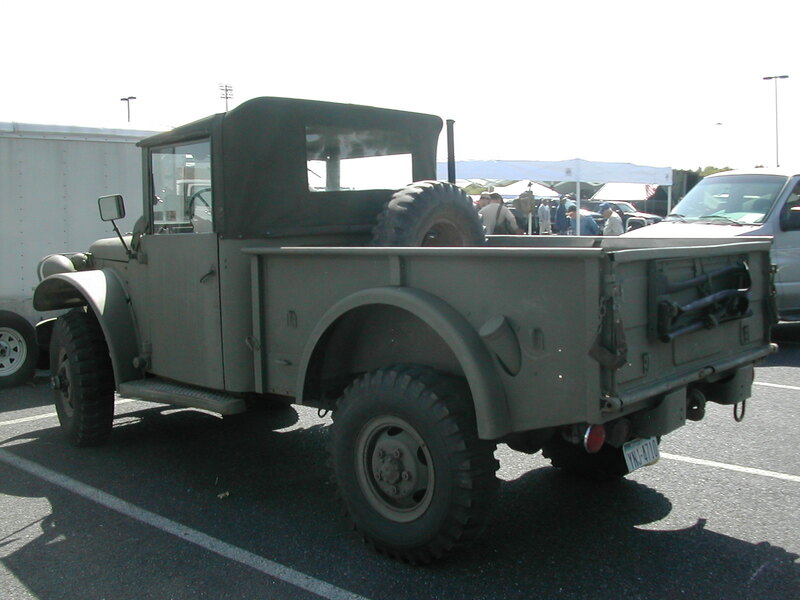 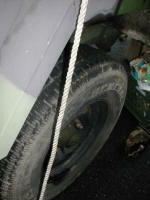 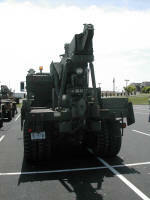 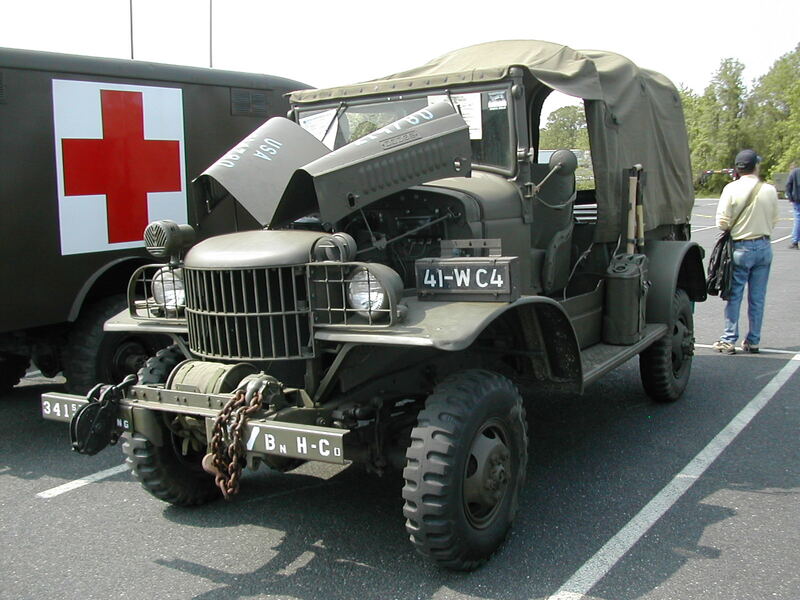 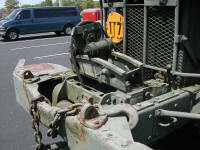 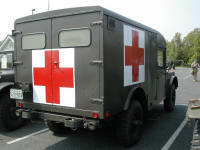 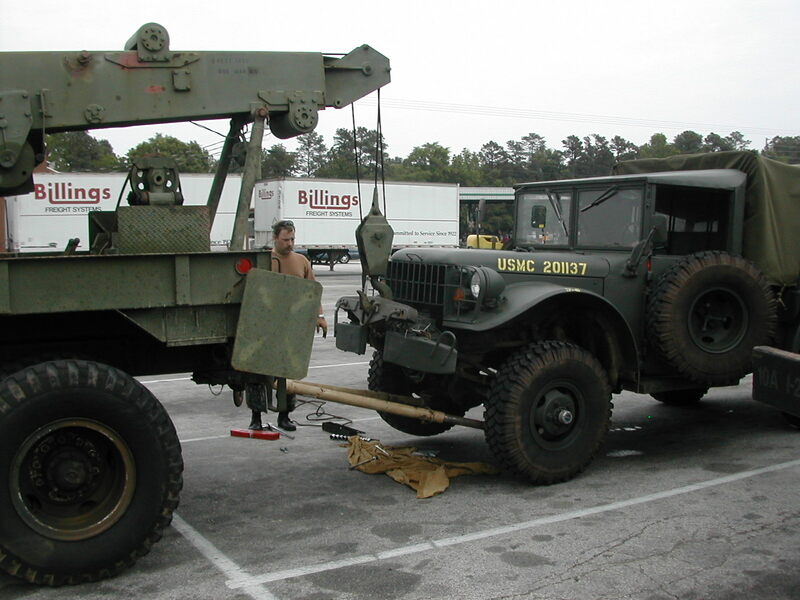 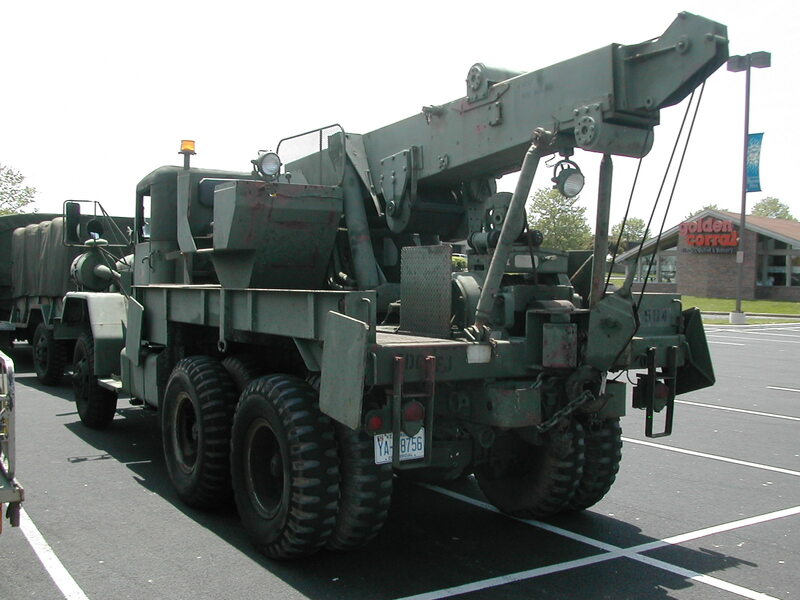 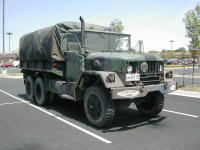 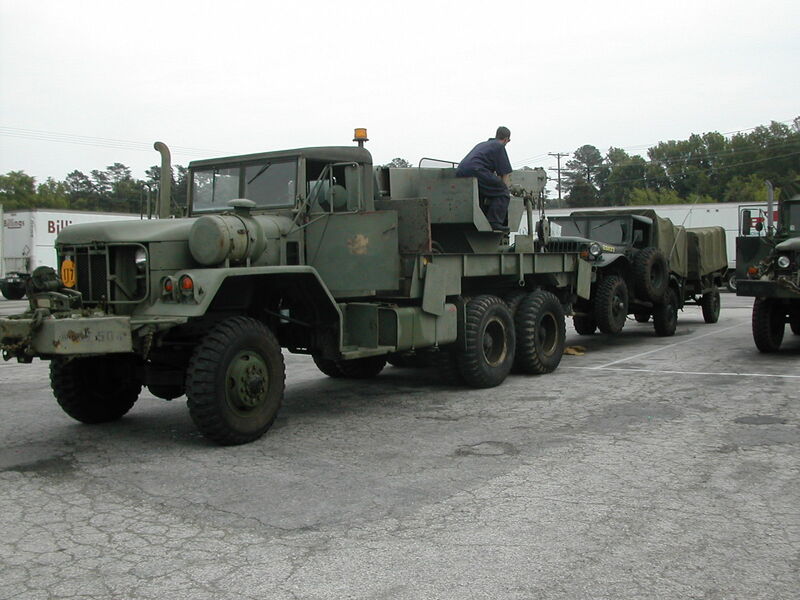 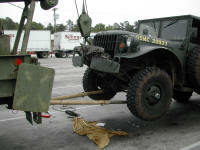 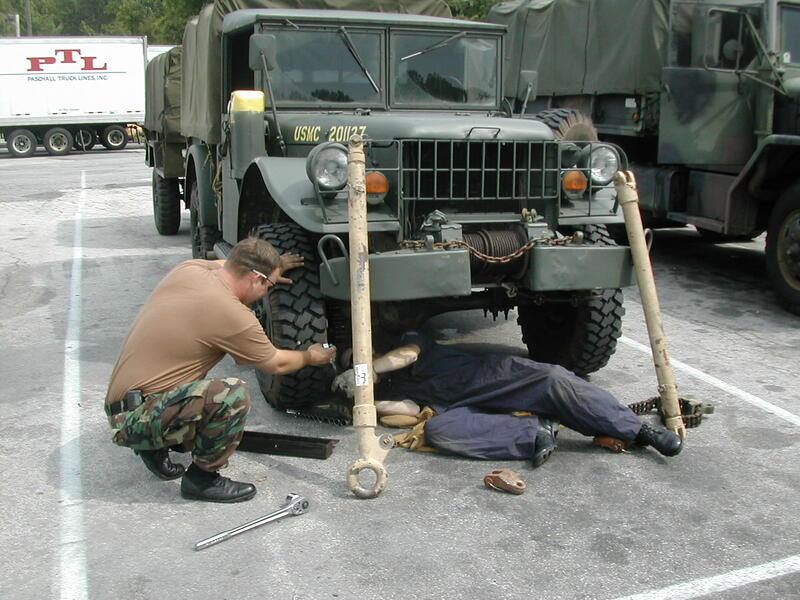 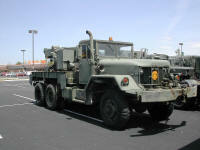 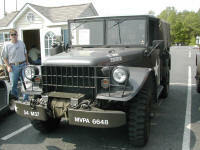 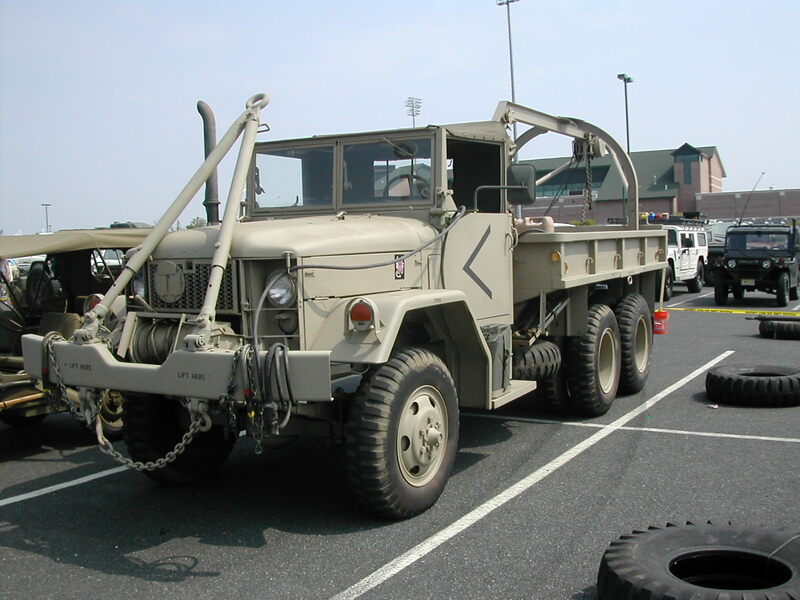 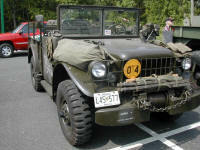 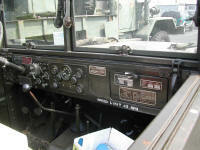 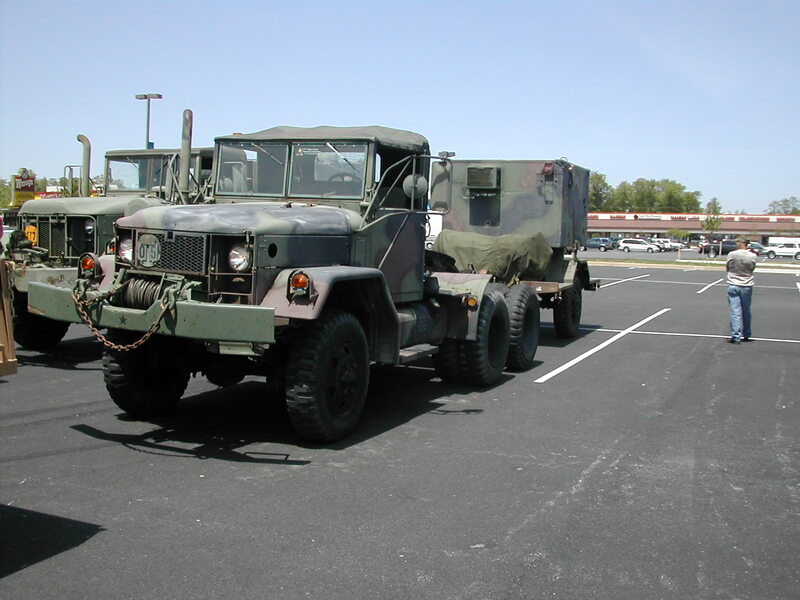 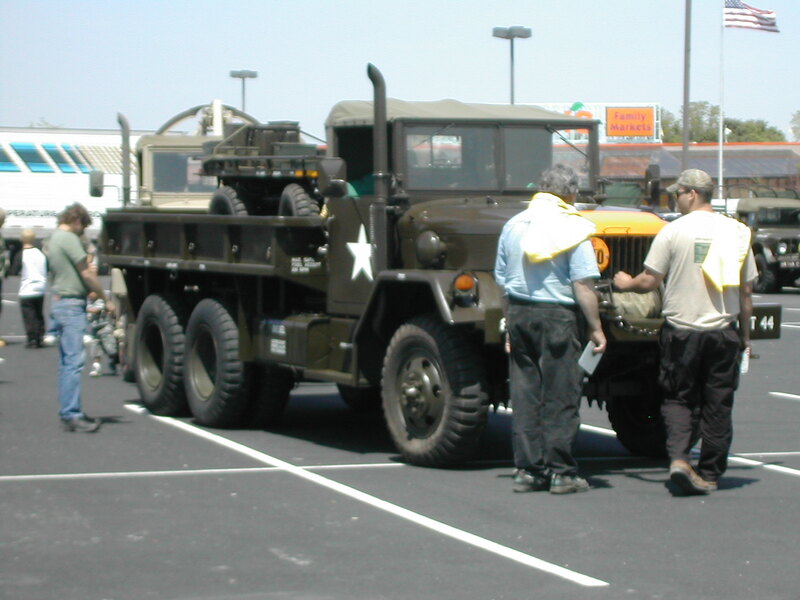 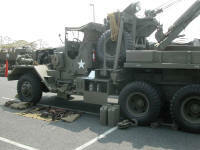 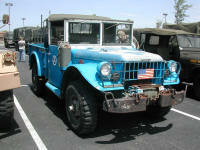 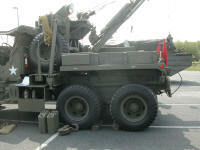 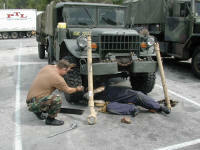 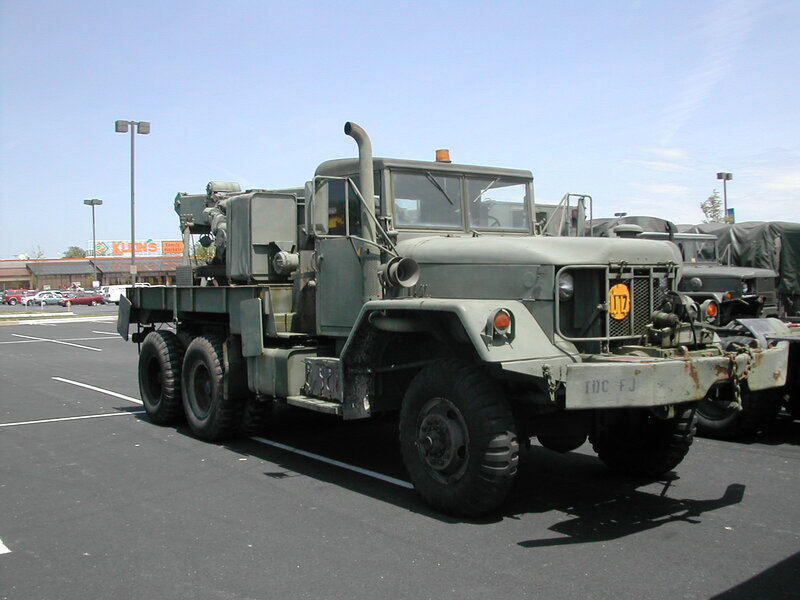 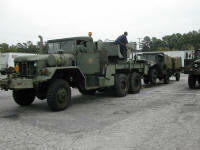 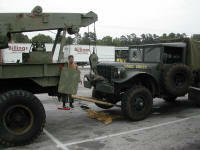 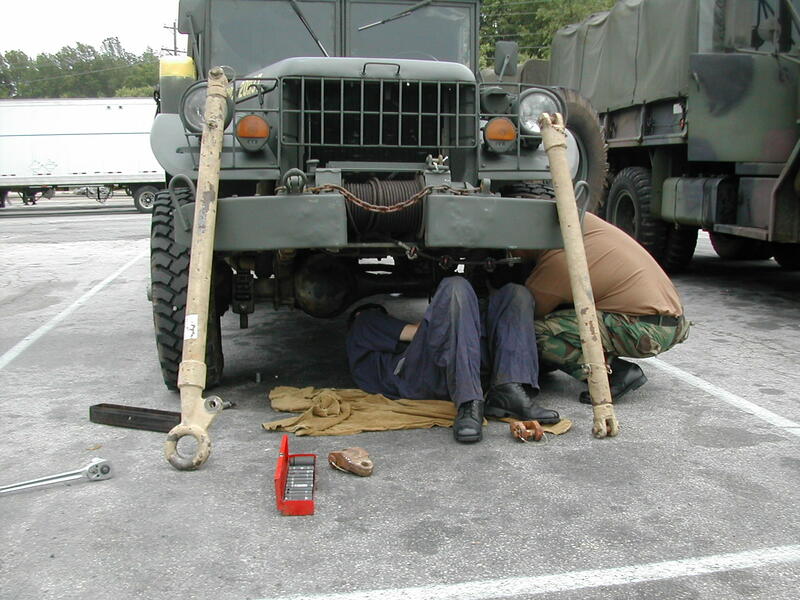 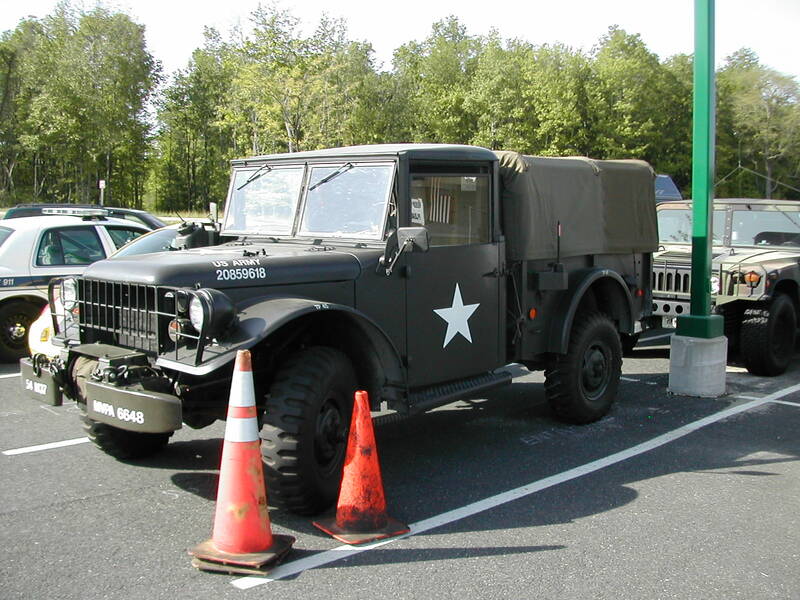 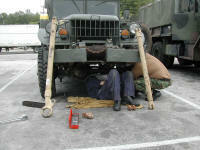 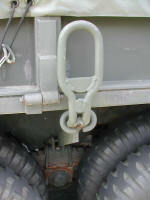 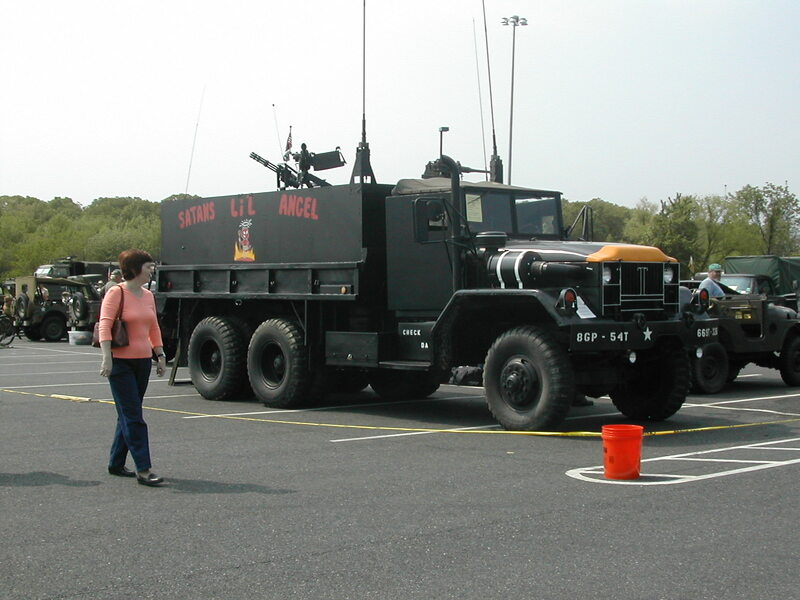 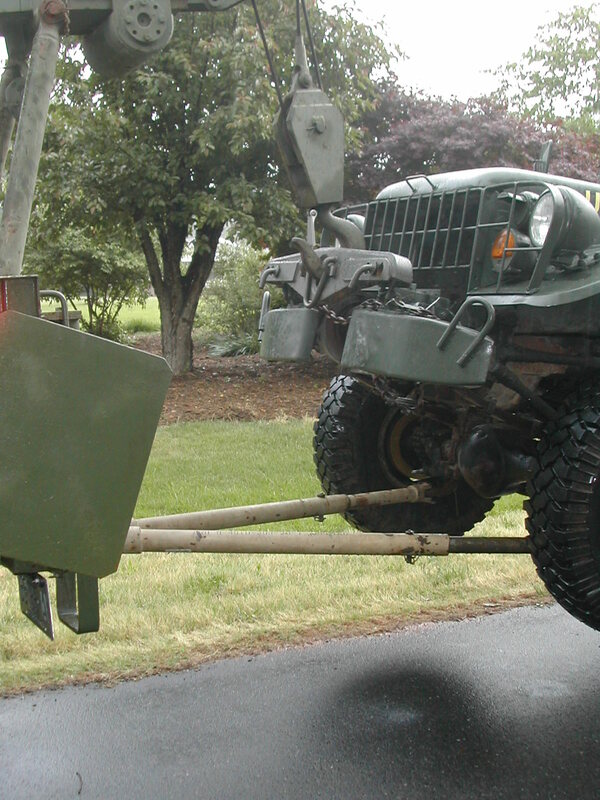 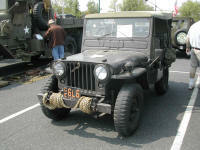 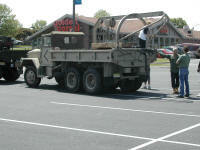 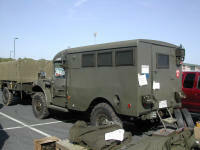 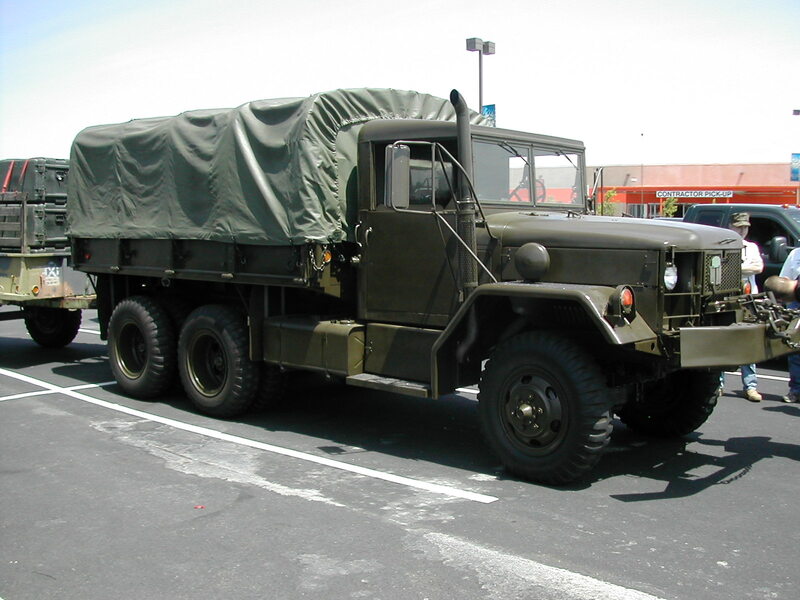 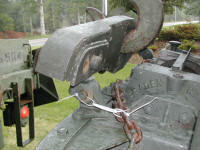 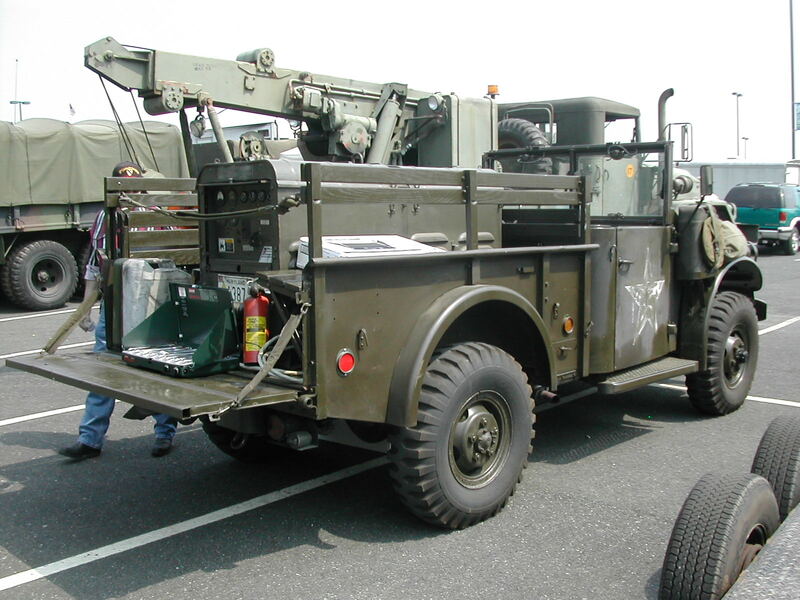 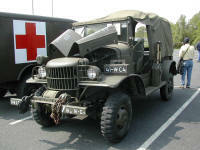 51-52 2.5 ton wrecker for sale by TNJ Murray of Dover, DE. 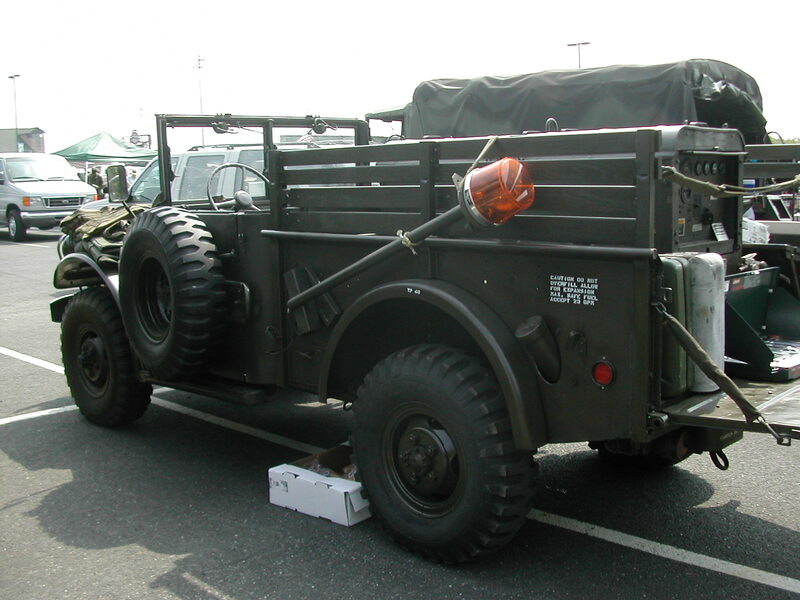 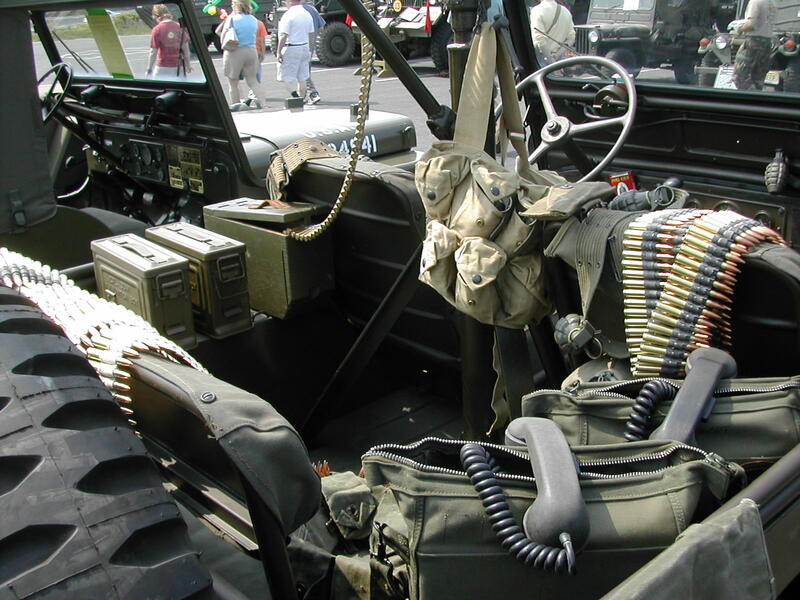 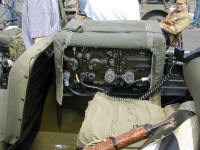 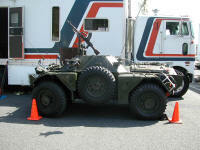 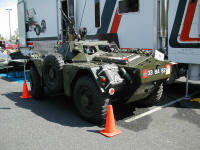 62 Gerry Zell's M37 with an excellent display of communications gear in the back. 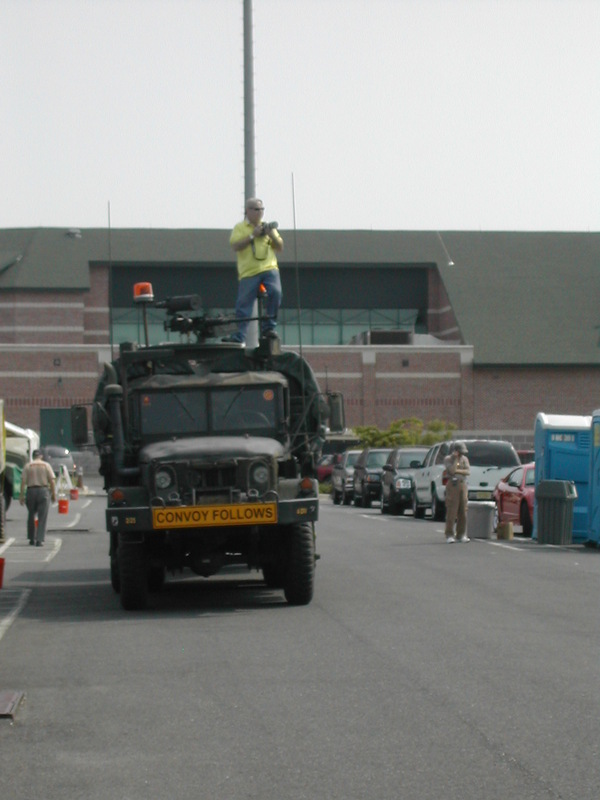 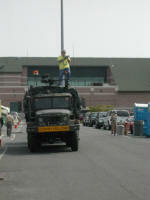 63-65 Bruce using his deuce as a vantage stop to take some "high level" photos of the vehicle display area at the stadium. 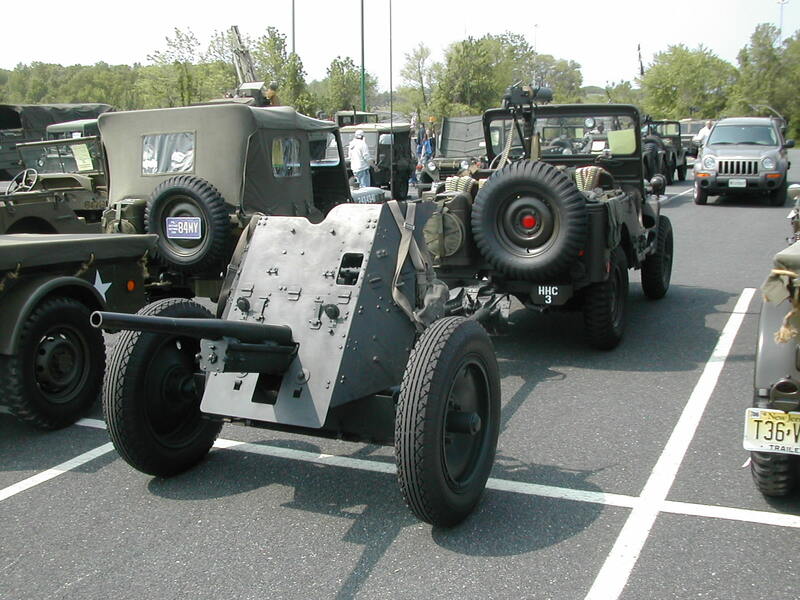 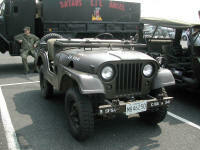 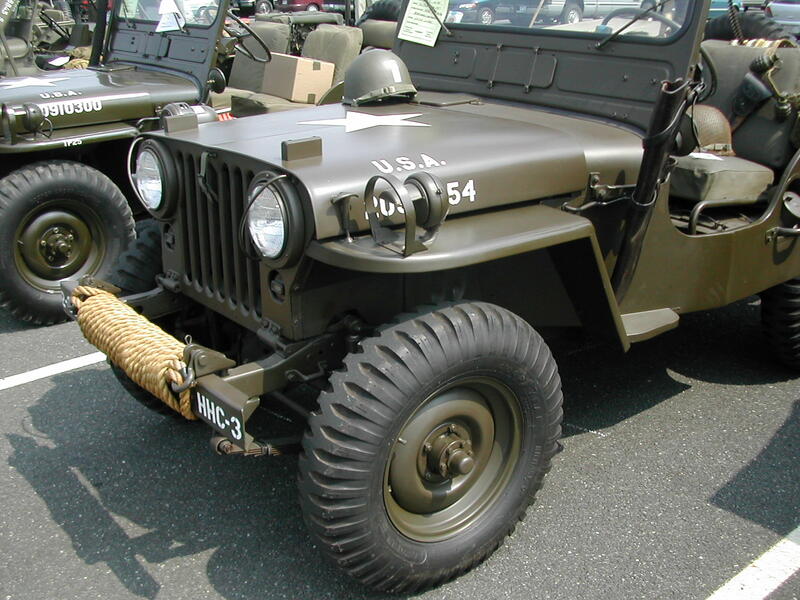 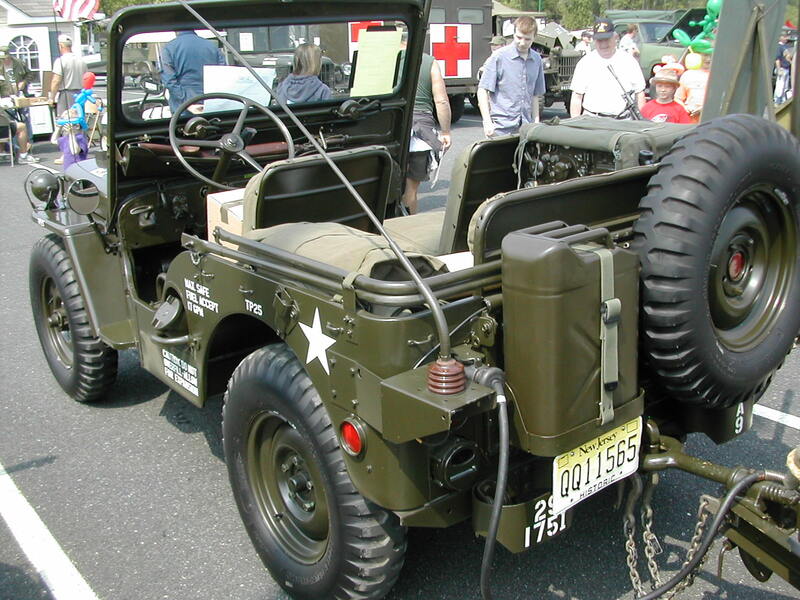 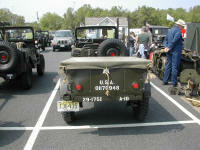 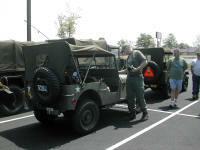 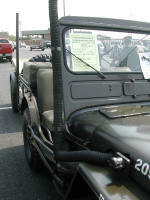 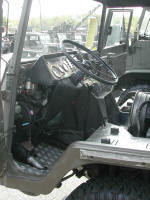 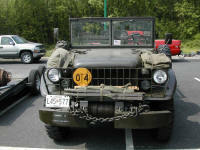 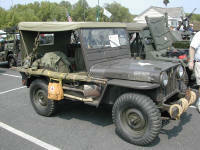 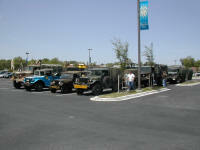 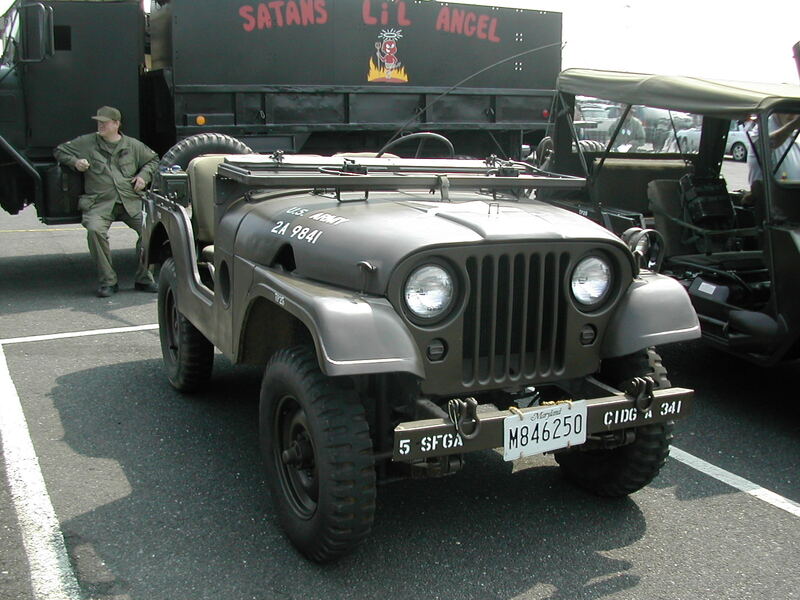 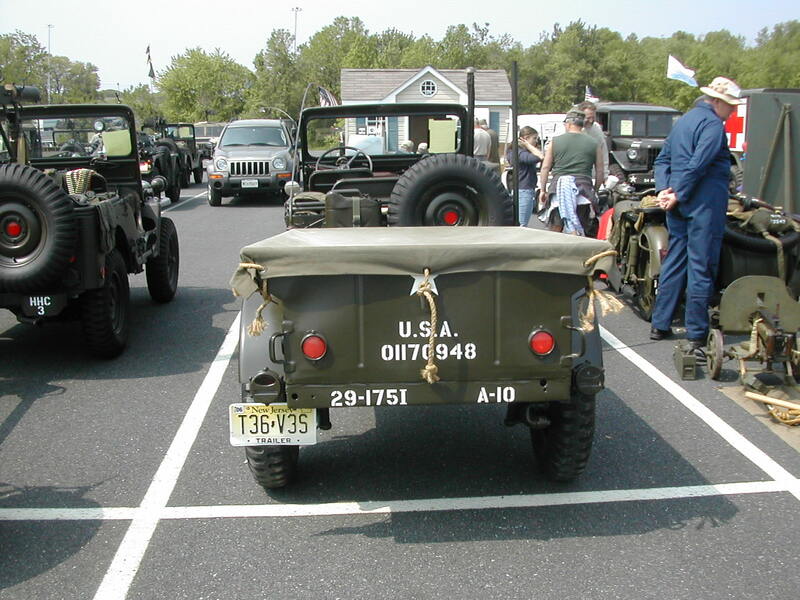 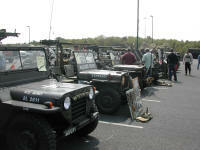 69 Jeeps lined up in the vehicle judging/display area. 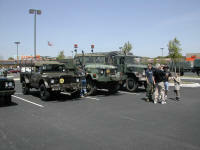 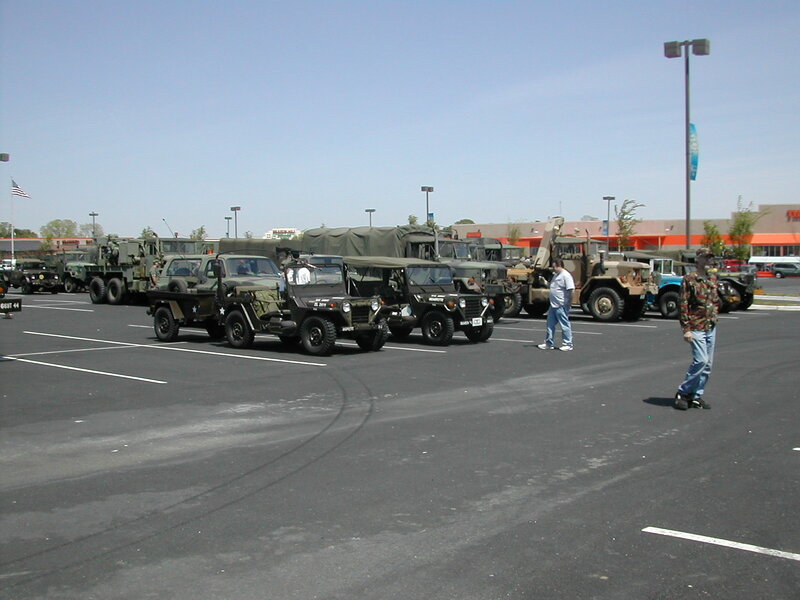 97 Jeeps lined up in the vehicle judging/display area. 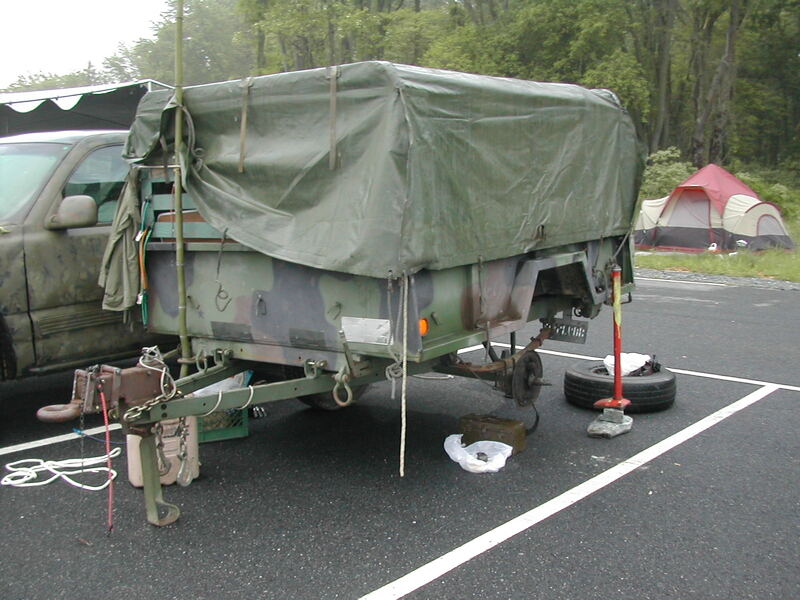 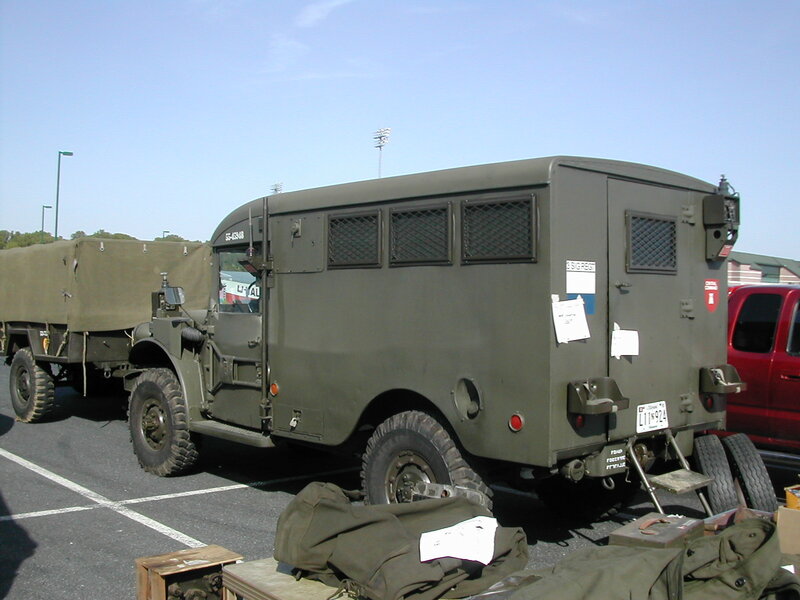 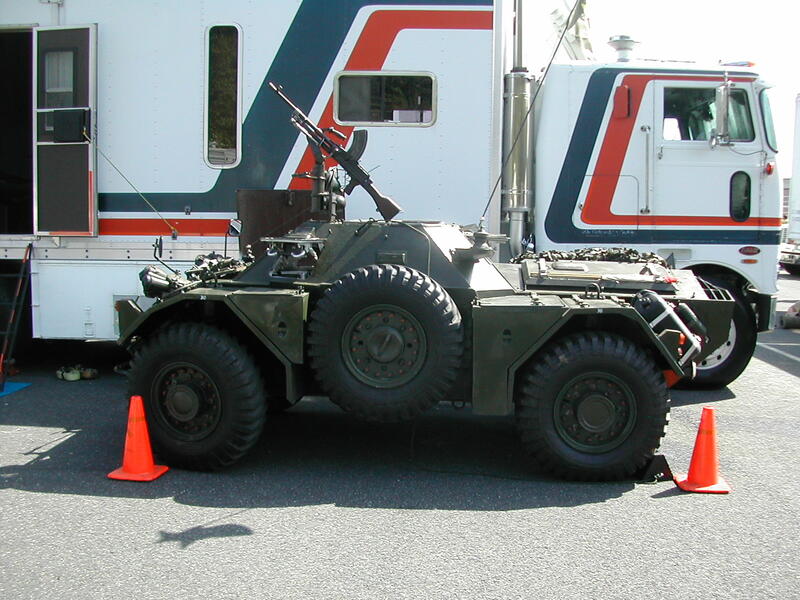 114 Cabell Garbee's M37 with a M101 hitched up... Trailer served to not only haul sale items to the show, but as a "hotel room" for the duration of the show. 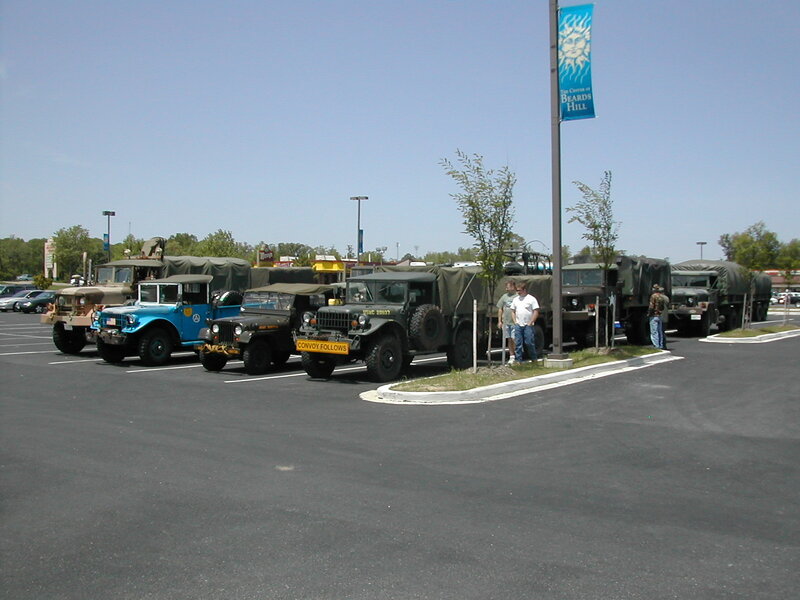 120 Sunday morning, Brandon, Jamie, Bjorn, and Cabell lined up ready to leave for the return trip home. 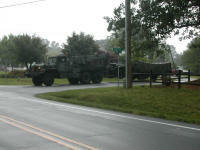 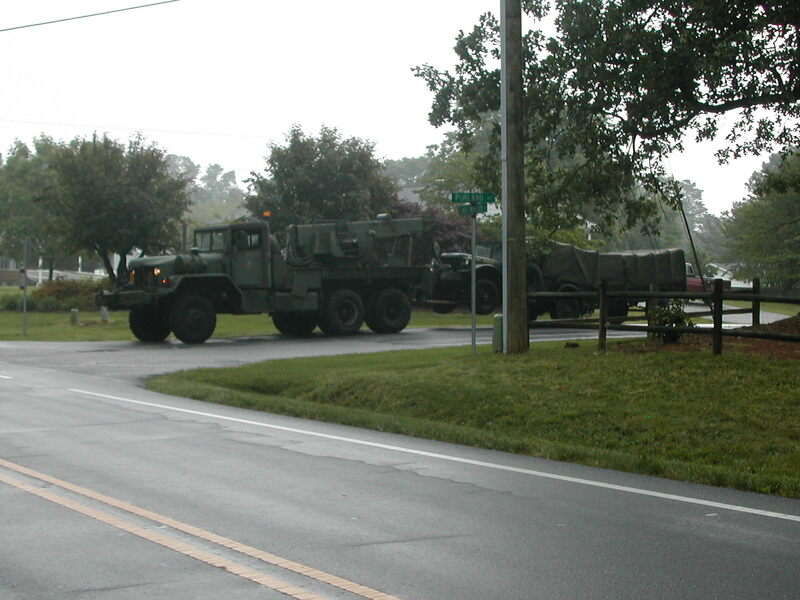 121-122 Lined up at a rest area just north of Richmond, VA.
139-140 A couple of shots showing the wrecker and my rig when we pulled up on the street across the road from my house prior to unhooking everything and sneaking my truck across the highway into my driveway.